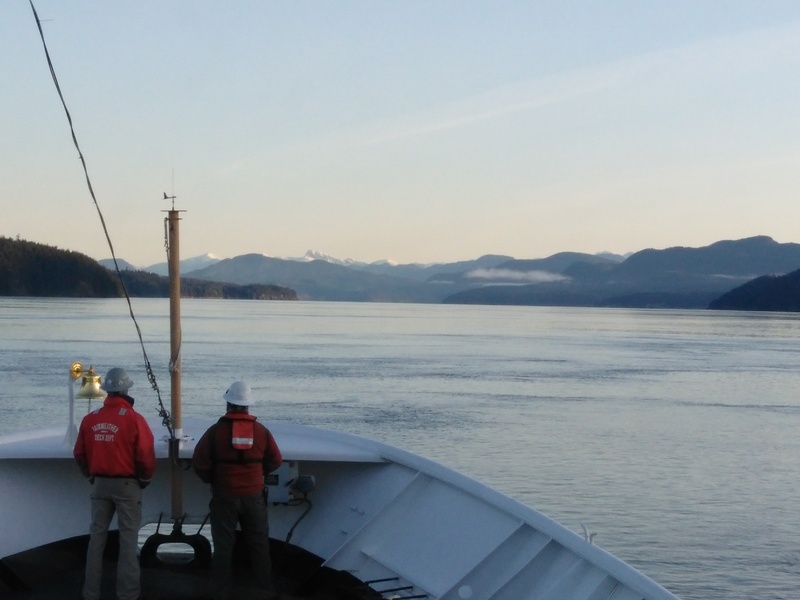 Over the past two days, the crew of NOAA Ship Fairweather has been hard at work on the first major project of the season, charting the ocean floor along the Queen Charlotte-Fairweather Fault System. 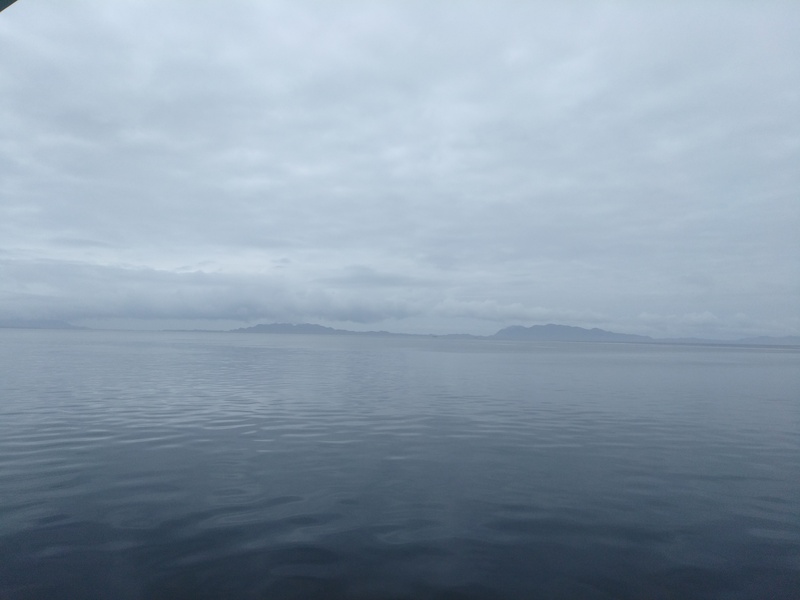 The project itself will take seven days, though with two days at sea before heading to port in Ketchikan, the survey techs have been focusing on the first sheet, D00245, roughly 900 kilometers offshore in an area known as West of Prince of Wales Island. 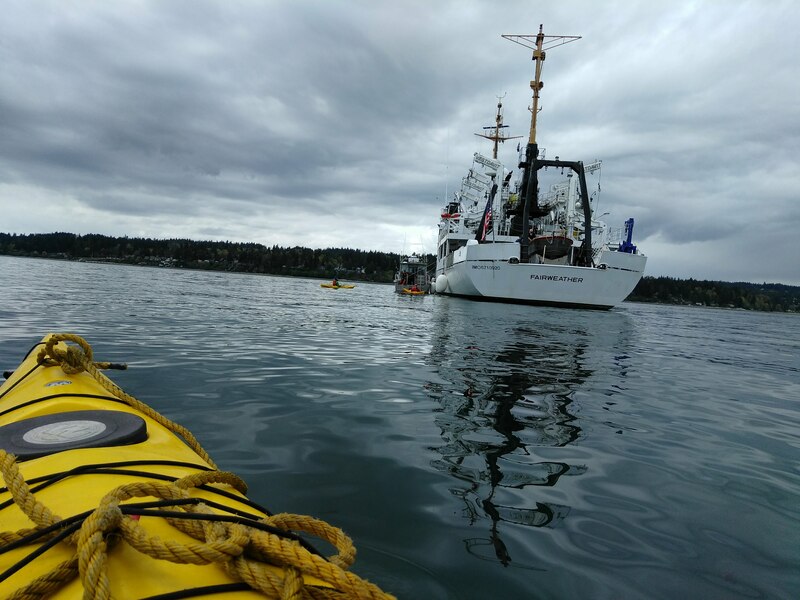 Fairweather is completing the survey in collaboration with the United States Geological Survey (USGS) which has spent the last three years researching and mapping the seafloor along the fault. Geologists are particularly interested in this fault as little is known about the region and the seafloor here is largely unexplored. Geologists believe that by studying the fault line and the geology of the ocean floor, they may be able to unlock secrets about the history of our oceans as well as develop new understanding of seismic activity that can keep communities safer when future earthquakes strike. One of the reasons the USGS turned to NOAA to complete its charting efforts is because of the tremendous ocean depths. 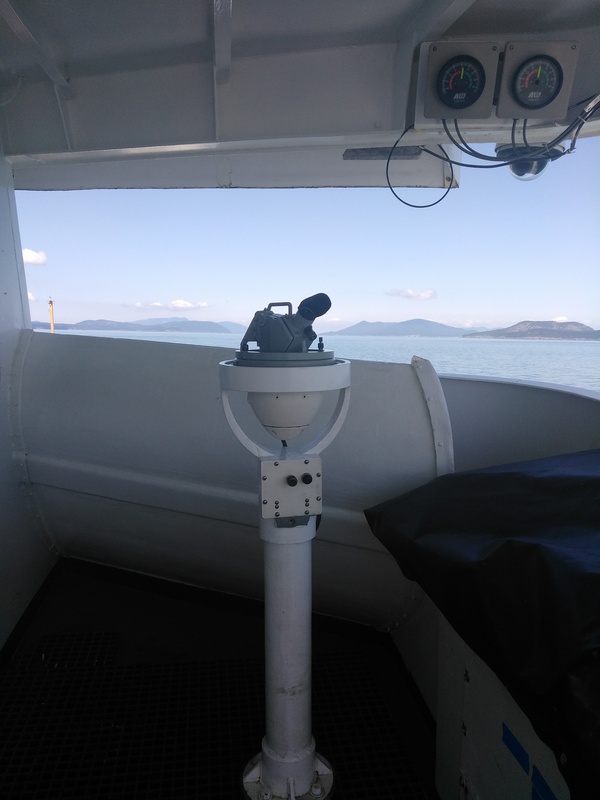 The survey techs are using Fairweather‘s multibeam echosounders for the project which will take a total of seven days to complete. Sonar pings from the ship’s transducer hit the ocean floor and bounce back to the ship, creating 2D and 3D charts of the ocean floor. Additionally, survey techs can learn more information about the type of surface on the ocean floor (sandy, rocky, etc.) based on the strength of the return of the sonar pings. Despite the seafloor in the area being some 15,000 years old, it has never been explored! Thus, for the survey techs and geologists working on this project, there is a sense of pure excitement in being able to explore and discover a new frontier and help others sea what humans have never seen before. 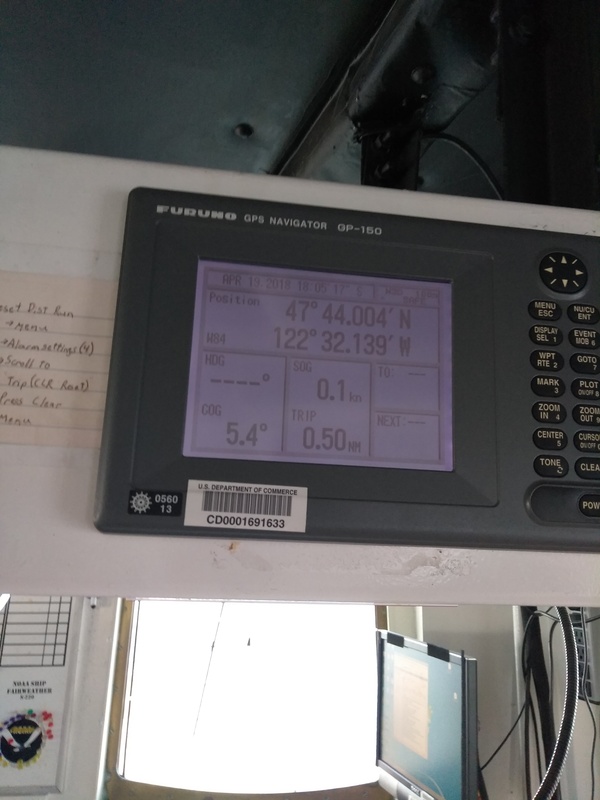 1520 Meters Down: The Number at the Top Left of the Screen Shows We’re in Water Nearly a Mile Deep! One of the geologists remarked that he was surprised to see that despite how old the ocean floor in the area is, little appears to have changed, geologically speaking in thousands of years. Another surprise for geologists is how the fault appears to be one large, long crack. Many other fault areas appear to be made up of lots of small, jagged, and complicated “cracks.” Another question to explore! Notice the colors which help survey techs see the changing depths quickly. The green, mostly vertical lines, show the ship’s course. To collect data, Fairweather runs about 6 hours in one direction, before turning around to run 6 hours in the opposite direction. This allows survey techs to gather more data about ocean depths with each turn. In total, survey techs collected nearly 48 hours of data. This meant survey techs working all night long to monitor and process all of the new information collected. 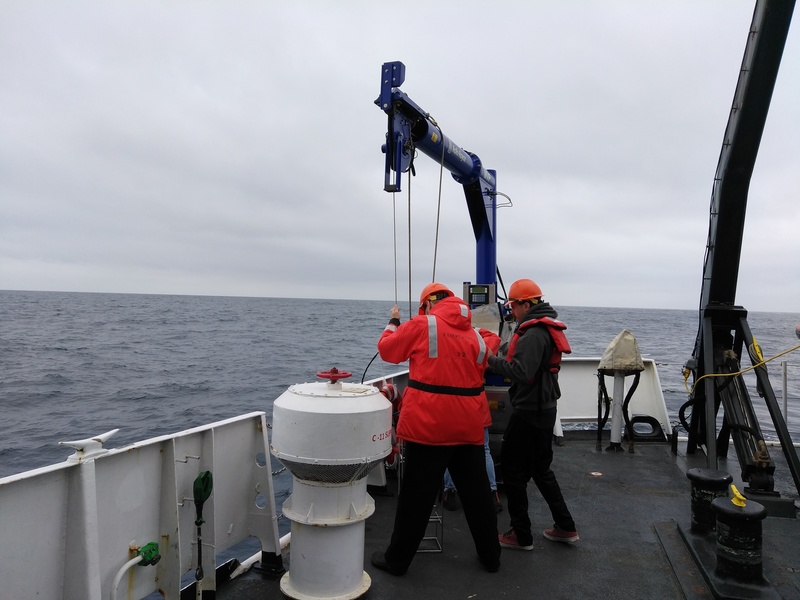 Just like on the launches during patch tests, survey techs deploy CTD’s to measure the water’s conductivity (salinity), temperature, and pressure. This information is key in order to understand the speed of sound in a given area of water and ensure that the sonar readings are accurate. Nothing But Blue Skies in Every Direction! 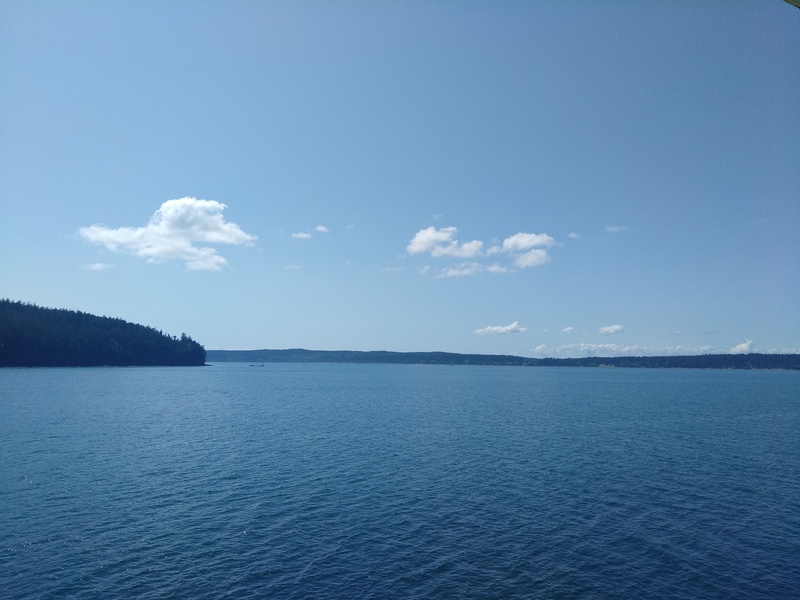 In striking contrast to the beautiful coastlines that framed the Inside Passage, the last two days have provided endless blue skies mixing with infinite blue seas. No land in sight! The open ocean is challenging (huge waves make the entire ship sway constantly and gives new meaning to earning one’s “sea legs”), but far more inspiring. I’m grateful for the glimpse into life at sea that NOAA has provided me. There is deep sense of trust among the crew, in their collective hard work that keeps us all safe in the middle of the ocean. There is also a wonderful sense of adventure, at being part of discovering something new. Just as explorers have sought after new frontiers for hundreds of years, Fairweather today is charting areas still unknown to humankind. 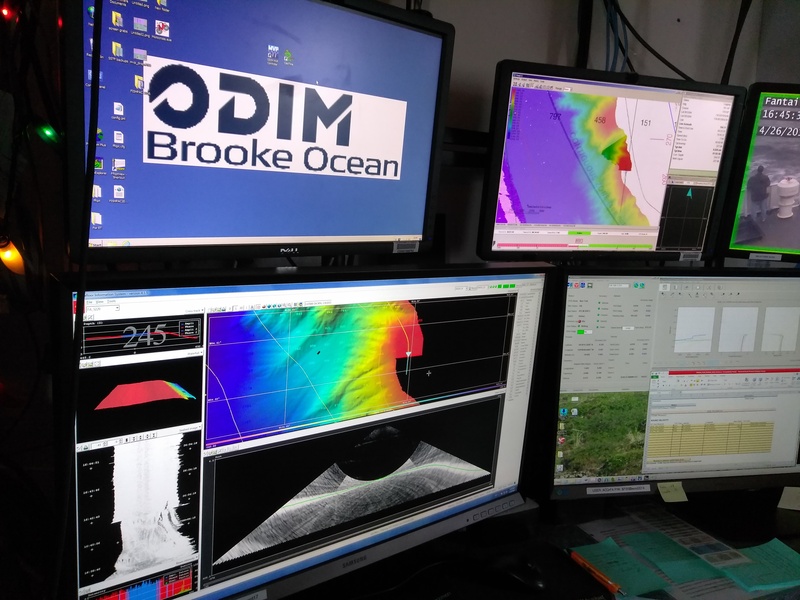 There is something truly invigorating about watching the sonar reflect the ocean floor in a rainbow of colors, in watching as peaks and valleys slowly are painted across the monitors in the plot room and bit by bit, another sliver of science is added to the charts. There is something particularly refreshing and exciting about seeing whales spray and play in the waves while standing on the ship’s bridge. I’m truly grateful to all onboard Fairweather and NOAA’s Teacher at Sea Program for this remarkable opportunity, and I look forward to sharing what I’ve learned with students back at Devotion. Prince of Wales Island is one of the southernmost parts of Alaska. Home to some 4,000 inhabitants, Prince of Wales Island is the 4th largest island in the US and the 97th largest island in the world. Originally home to the indigenous Kaigani Haida people, Spanish, British, and French explorers all passed by the island in the 1700 and 1800’s. In the late 1800’s, miners came to the island looking for gold, copper, and other metals. 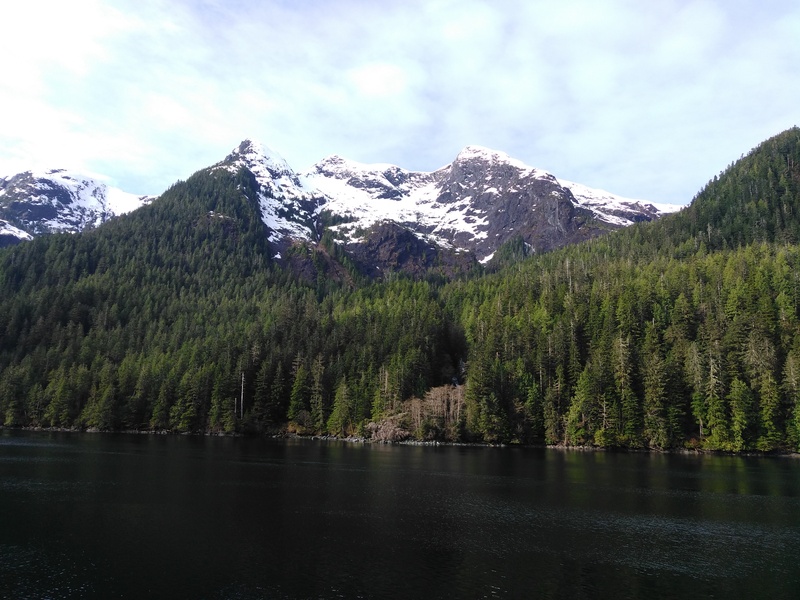 Today, most of the land is protected as the Tongass National Forest covers a great portion of the island. Challenge Question #5: Devotion 7th Graders – Can you find the depths of the Charles River, the Boston Harbor, and 900 kilometers offshore the Massachusetts coast? What sort of aquatic life exists in each area? What does the river/seafloor look like in these areas? Create a comic strip or cartoon showing your findings. 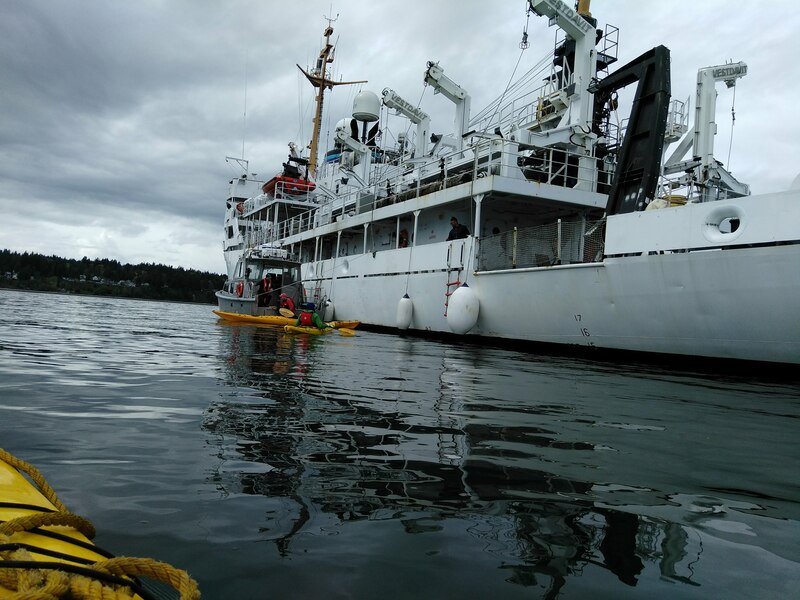 NOAA Ship Fairweather has begun its transit to Alaska for the heart of the field season which means transiting the famous Inside Passage, a roughly two day voyage through a stretch of nearly a thousand islands between Washington State and Alaska. 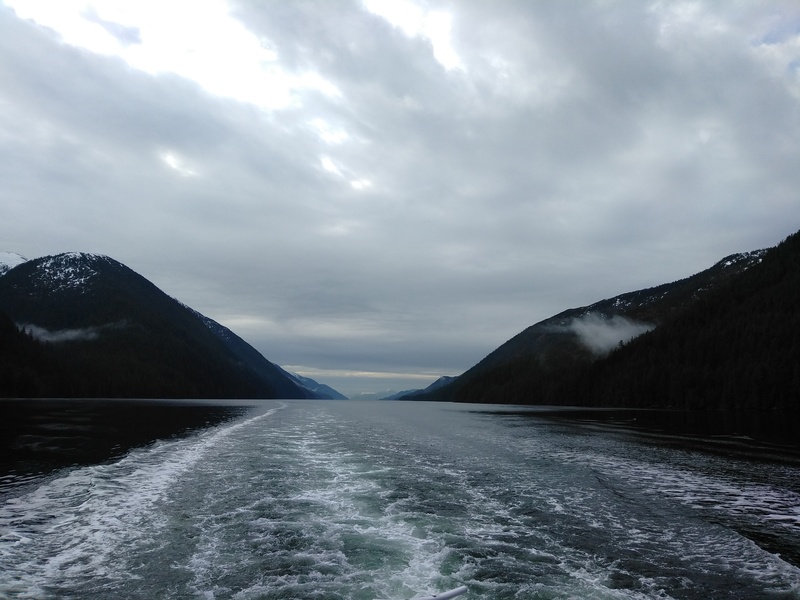 The more protected waterways of the Inside Passage provided a smooth, calm ride. I took advantage of the transit to spend more time on Fairweather‘s bridge in order to learn a bit about navigation. 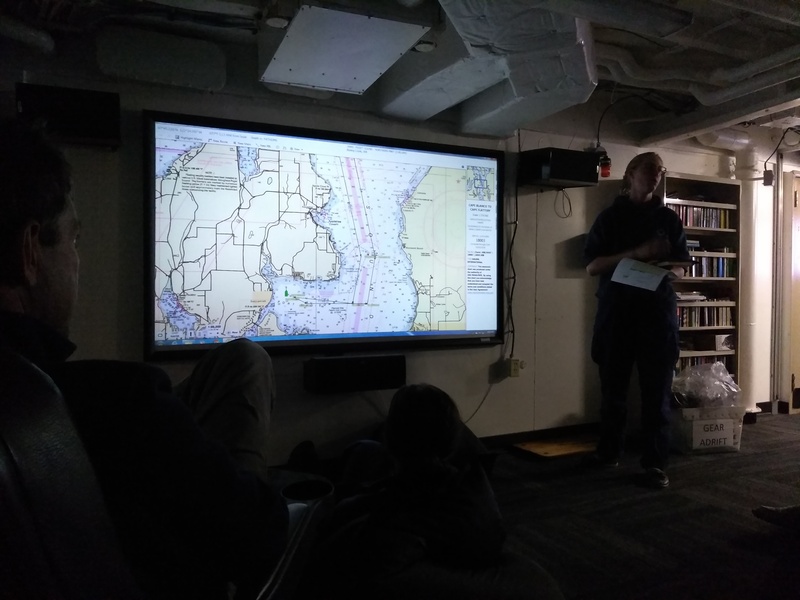 One thing that quickly became clear on the bridge of Fairweather is that for many navigational tasks, the crew has at least three ways of being able to obtain needed information. For example, navigational charts (maps) show two compasses: magnetic and true north. The inner circle represents the magnetic compass, which in reality points 17 degrees right of true North and is dependent upon the pull of the Earth’s magnetic core. 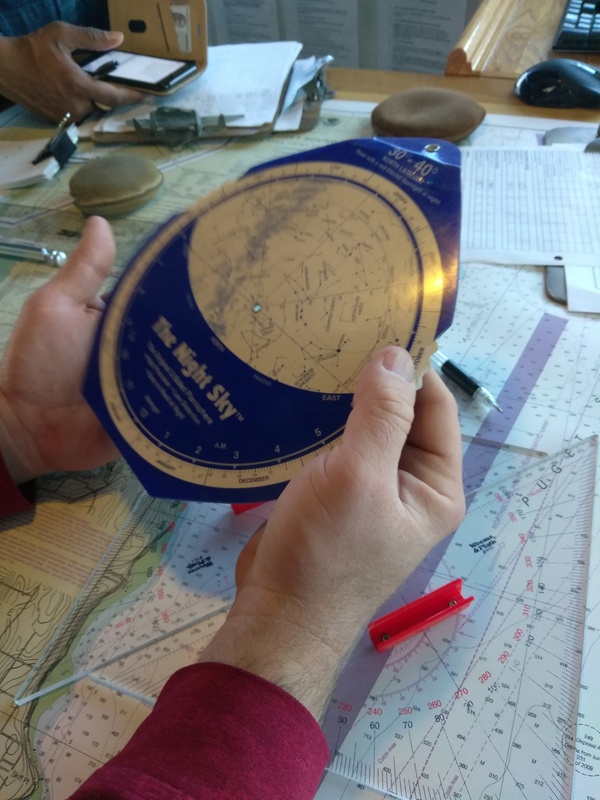 Because the magnetic compass can be offset by the pull of the ship’s magnetic fields (the ship is made of steel, after all), Fairweather’s compass is actually readjusted each year. 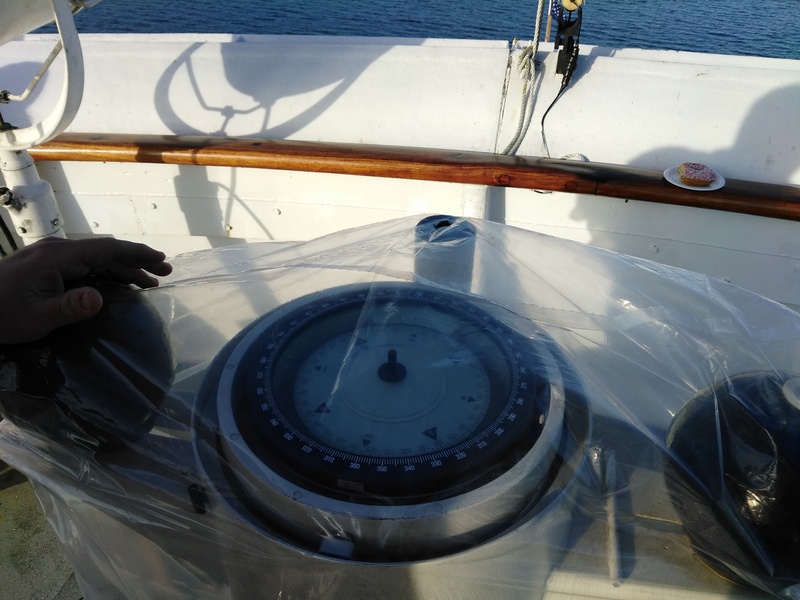 During our Inside Passage transit, a specialist came aboard near Lopez Island to reset the ship’s magnetic compass. The ship’s magnetic compass is located on the flying deck, just above the bridge. So, to be able to read the compass from the bridge, the crew looks through a series of mirrors above the helm. Notice that next to the mirrors, is a digital display that reads “78.” This is an electrical reading from the gyrocompass. The gyrocompass reflects “true North” also referred to as geographical North. 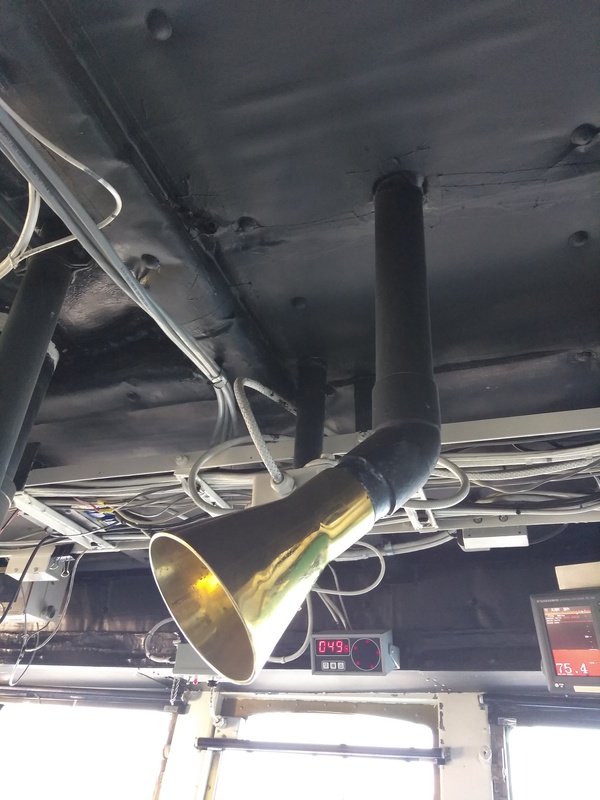 When at sea, a crew member on the bridge takes “fixes” every fifteen minutes, both day and night. To take a fix, the crew member uses an auxiliary compass and chooses three landmarks on shore as points. The crew member then lines up the viewfinder and records the degree of the line formed between the ship and the given point. The Crew Focuses the Auxiliary Compass on a Landmark on Shore. This Allows for a Reading on the Gyrocompass. Next, the crew member plots the three points on the chart using triangles (similar to giant protractors). The point where the three lines intersect is the ship’s current location. Though technically, the crew could just plot two points ashore and look for where the lines intersect, but as a way of triple checking, the crew chooses three points. Then, if a line doesn’t intersect as expected, the crew member can either retake the fix or rely on the other two points for accuracy. In addition to using the two aforementioned compasses to determine the ship’s location, the open seas often mean majestic night skies. Some of the crew members told me they also look to the stars and find the Big Dipper and North Star. A central theme on the bridge is being prepared: if both compasses malfunction, the crew can still safely guide Fairweather along its course. In addition to being able to take fixes and locate constellations in the night sky, modern day technology can make the crew’s job a bit easier. The ship’s latitude and longitude is continually displayed by an electronic monitor above the helm via GPS (Global Positioning System). Below, the ship’s Electronic Navigation System (ENS) essentially acts as Google Maps for the sea. Additionally, the ENS provides a wealth of data, tracking the ship’s speed, wind, and other contacts. 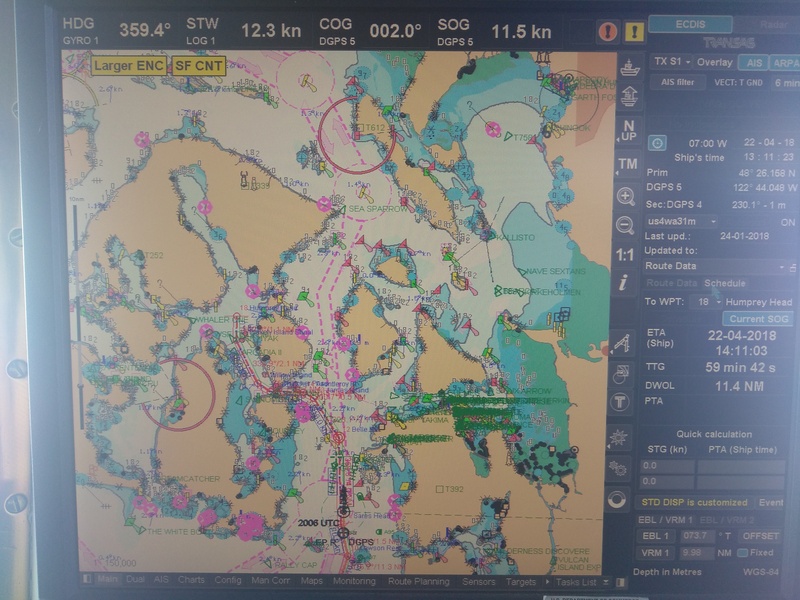 The Electronic Navigation System – Sort of Like Google Maps for the Ship! Next to the ENS on the bridge is the ship’s radar, which shows other vessels transiting the area. 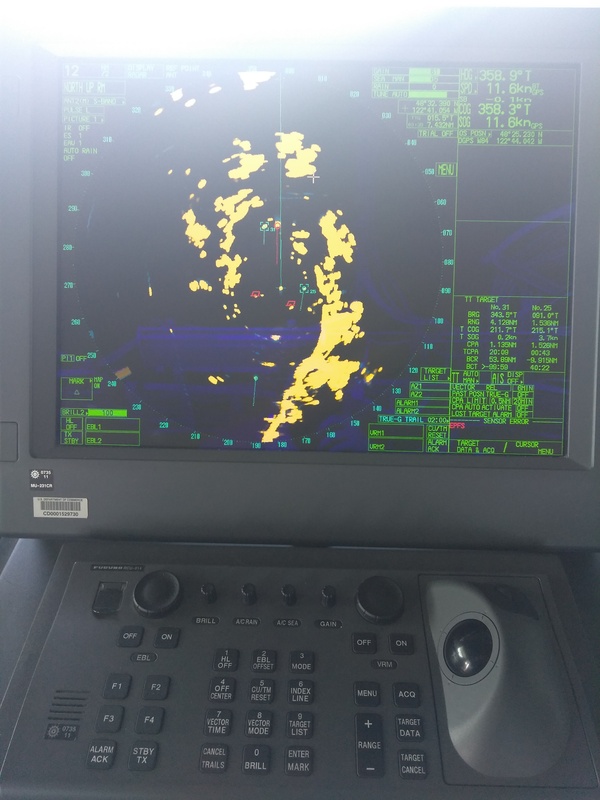 Similar to ENS, the radar system also provides information about the ship’s speed and location. Wind matters in navigation. The force and direction of the wind can affect both currents and the ship’s route. 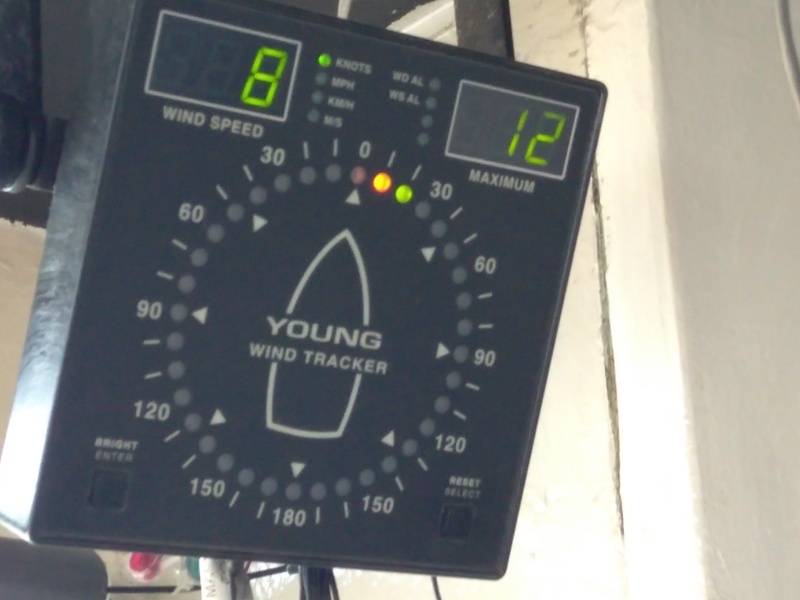 Winds may push the ship off course which is why taking fixes and constantly monitoring the ship’s actual location is critical in maintaining a given route. The wind can be monitored by the weather vane on the bow, the electronic wind tracker above, or on the ENS below. Additionally, a crew member demonstrates a wheel, used for calculating and recalculating a ship’s course based on the wind’s influence. On the bridge, multiple ways of being able to perform tasks is not limited to navigation alone. 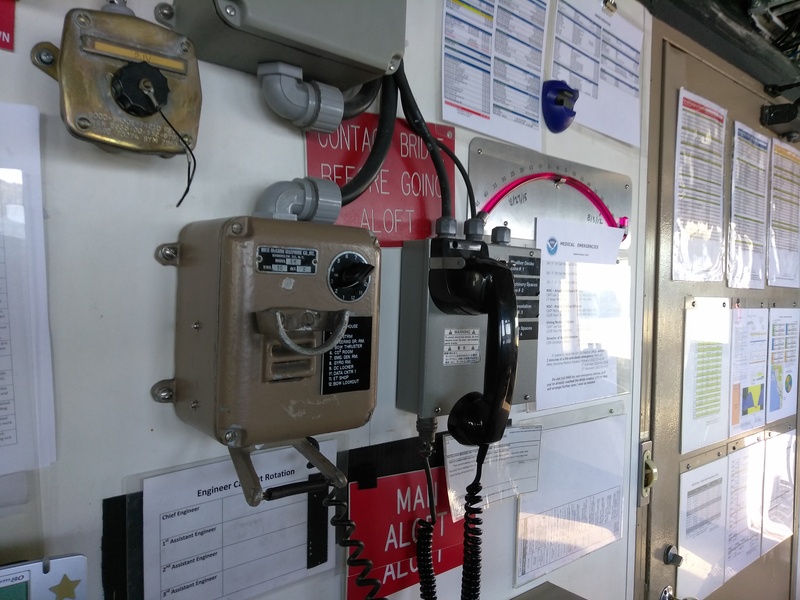 Communicating quickly on a ship is important in case of an emergency. Fairweather is equipped with various communication systems: a paging system, an internal telephone line, cell phones, satellite phones, etc. 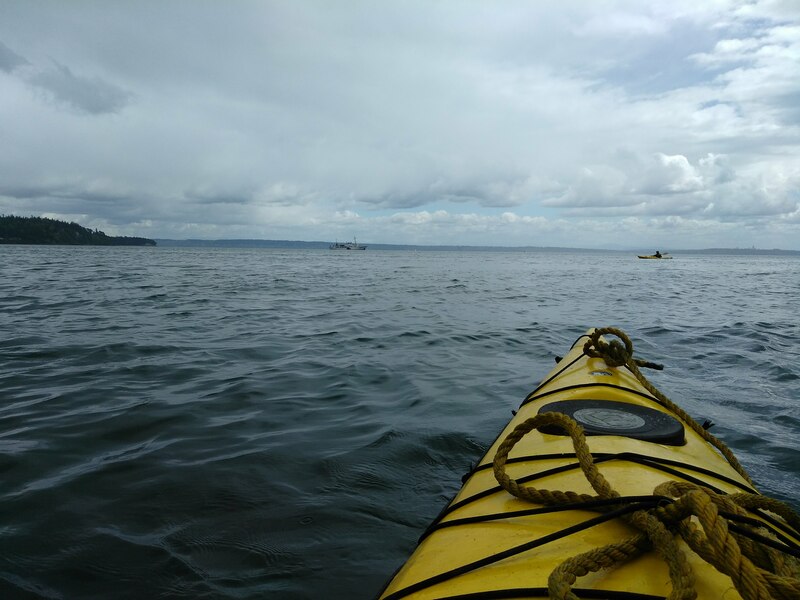 Just before leaving Puget Sound, I had the chance to go kayaking for a few hours with two of the crew members. 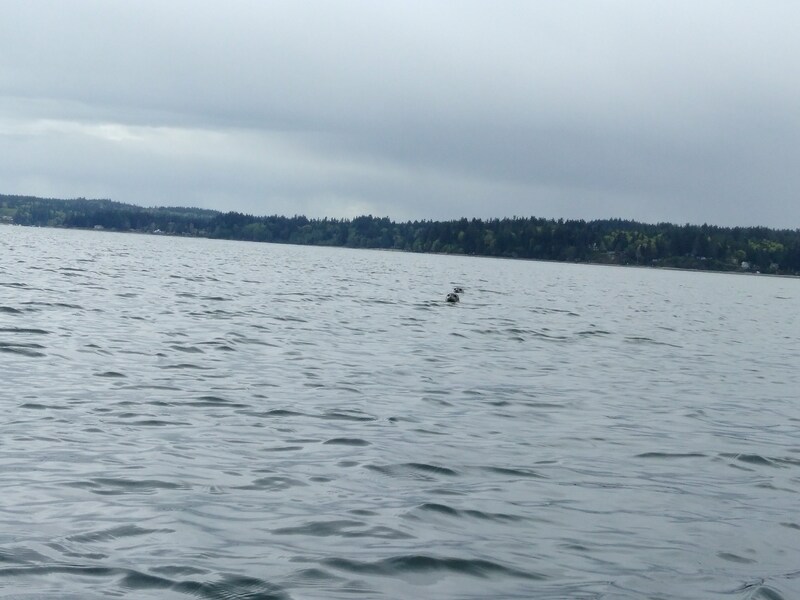 We had great luck; not only was the water placid, but harbor seals played for nearly an hour as we paddled around one of many coves. It was neat to see Fairweather from yet another perspective. 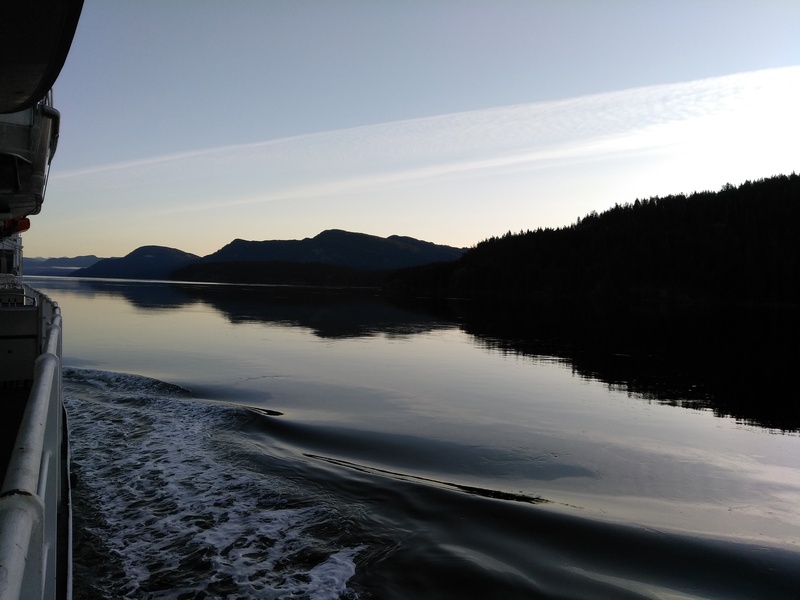 The Inside Passage is a series of waterways and islands that stretches from Puget Sound, just north of Seattle, Washington on past Vancouver and British Columbia and up to the southeastern Alaskan panhandle. In British Columbia, the Inside Passage stretches over more than 25,000 miles of coast due to the thousand or so islands along the way. In Alaska, the Inside Passage comprises another 500 miles of coastline. 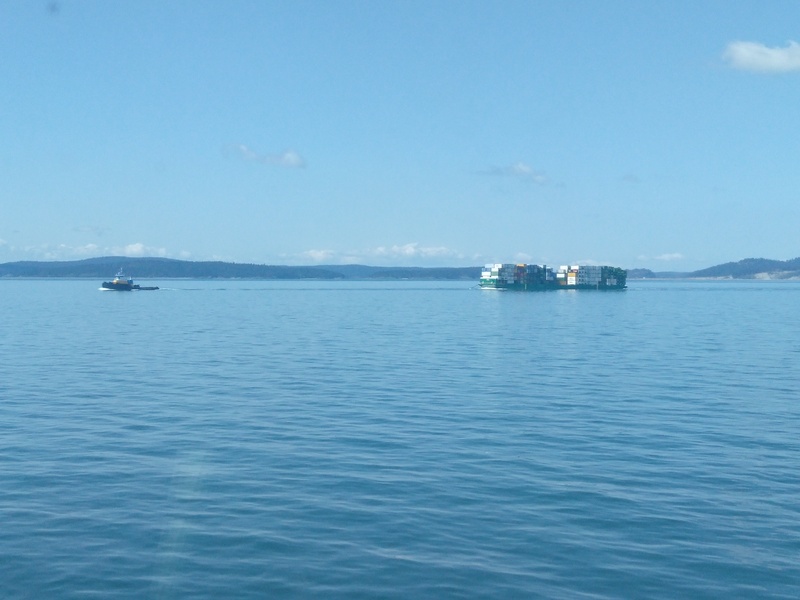 Many vessels choose the Inside Passage as their preferred coast as it is much more protected than the open waters of the Pacific Ocean to the immediate west. 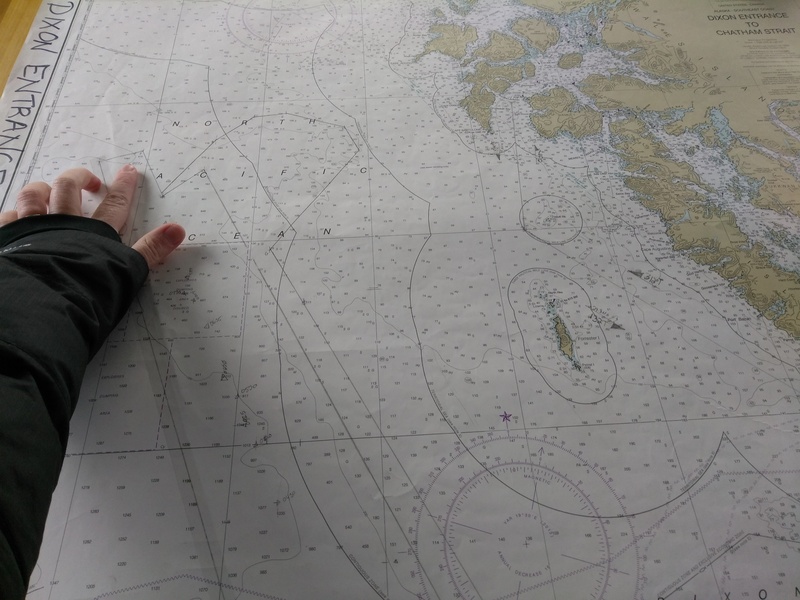 Nonetheless, rapidly changing tidal lines, numerous narrow straits, and strong currents make navigating the Inside Passage a challenging feat. 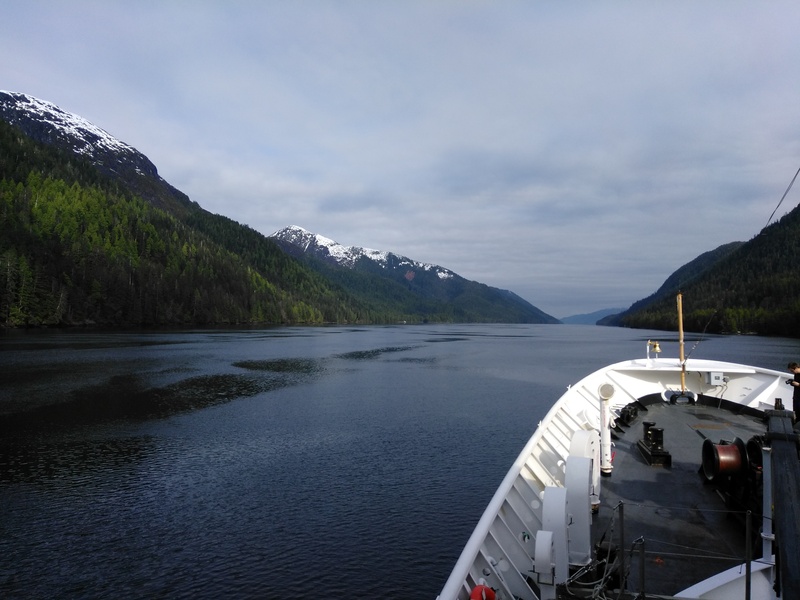 In addition to frequent transit by commercial vessels, tugboats, and barges, the Inside Passage is also increasingly popular among cruise ships and sailboats. On average it takes 48-60 hours to navigate. 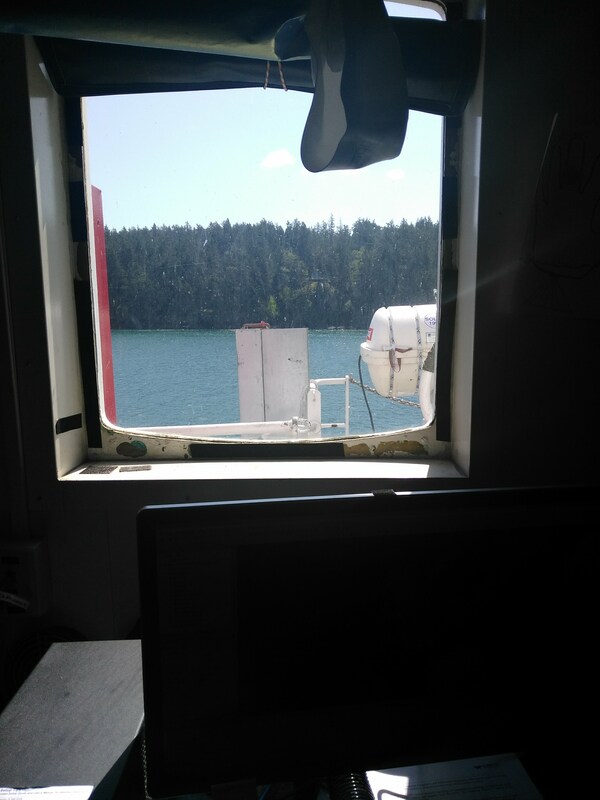 Crew on Anchor Watch on the Inside Passage as We Approach Seymour Narrows. Note the Weathervane on the Bow. Impossible to Get Tired of These Views! Challenge Question #4: Devotion 7th Graders – NOAA and NASA collaborated to produce the National Weather Service Cloud Chart which features explanations of 27 unique cloud types. Clouds can tell sailors a great deal about weather. 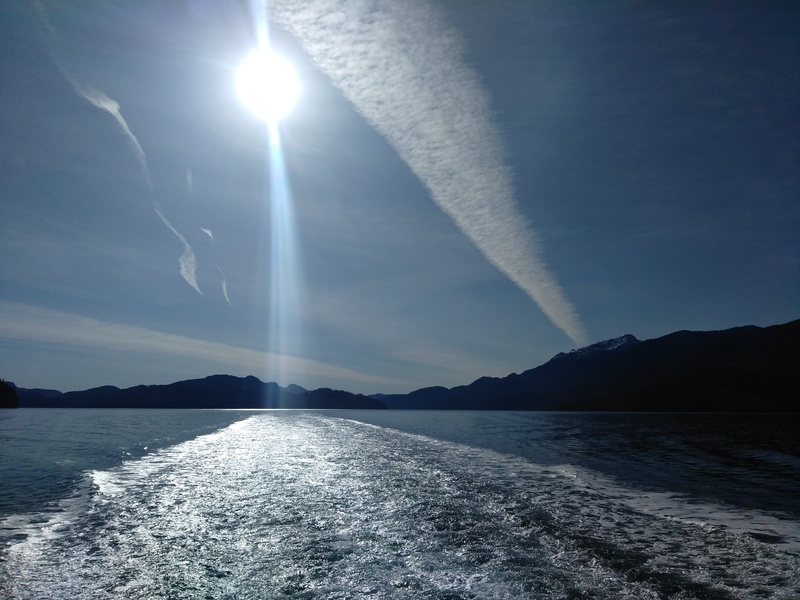 Can you identify the type of clouds in the ten above pictures of the Inside Passage? Then, record your observations of clouds for five days in Brookline. What do you notice about the relationship between the clouds you see and the weather outside? 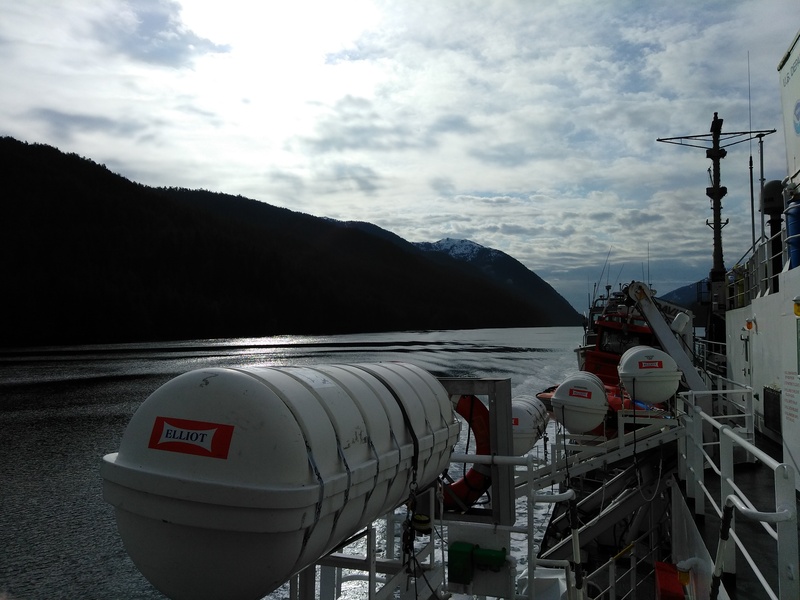 What do you think the clouds in the pictures above would tell sailors about the upcoming weather as they navigated the Inside Passage? Present your observations as journal entries or a log. A Bonus Challenge. . .
Just outside the bridge on both the Fairweather‘s port and starboard sides are little boxes with two thermometers each. 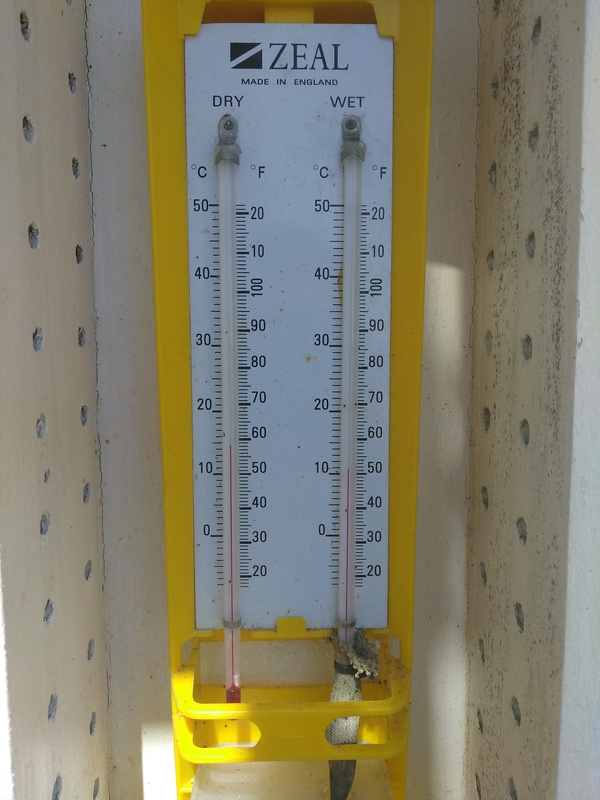 What is the difference between dry and wet temperatures? Why would sailors be interested in both measurements? 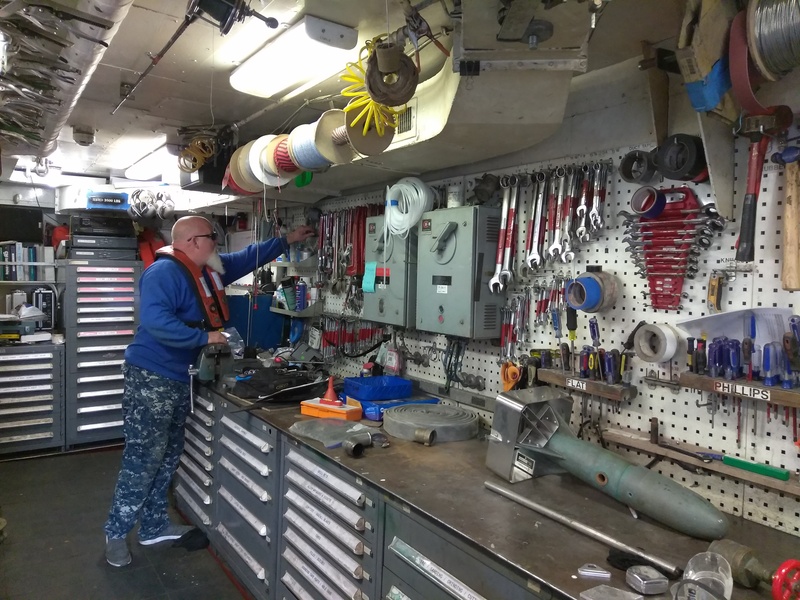 As NOAA Ship Fairweather began its northward journey through the Inward Passage, I took advantage of a few days at sea to conduct interviews with crew from each of the various departments onboard: deck crew, engineers, officers, stewards, and survey technicians. Through the interview process I realized just how much goes in to making Fairweather successful. Two themes arose again and again in conversations: First, the crew of the Fairweather loves what they do — the crew’s commitment and passion for being at sea was unanimous. . .and contagious. Second, Fairweather is family. Enjoy the five interviews below, the first of which is with a Edward Devotion School alum. . .
Q: What is your role aboard NOAA Ship Fairweather? A: I’m an able-bodied seaman or AB. My permanent job is to take care of the ship. 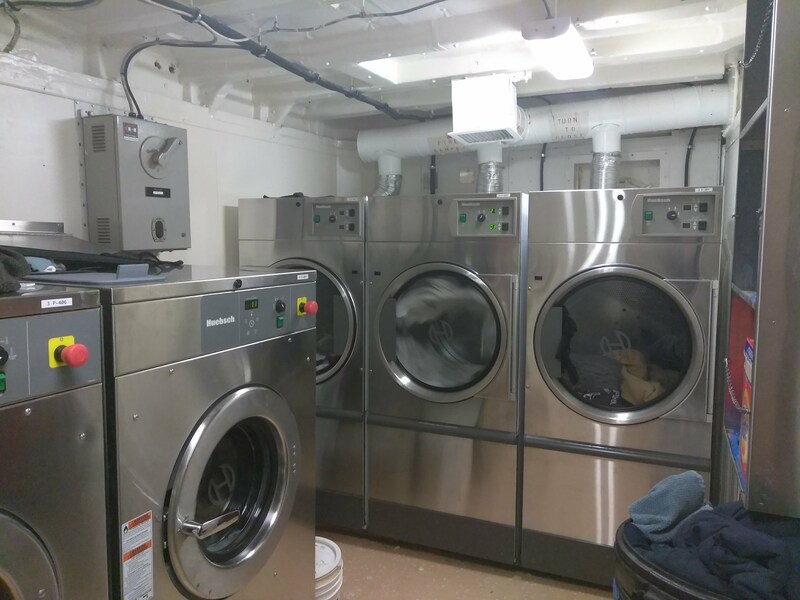 Some duties include maintaining the ship’s cleanliness, ensuring the security of the vessel, and steering the ship. A: Without AB’s, the ship can’t be driven. AB’s also maintain the security of the ship and watch out for the safety of the ship’s personnel. AB’s work on the upkeep of the ship’s inside and outside condition, checking to prevent rust and other damage. The AB’s ready the equipment for different missions and load and unload equipment, too. Finally, the AB’s help with the officers’ work, with surveying, and with engineering. Q: What do you enjoy the most about your work? A: I love being at sea. I love being able to see different sunrises and sunsets every day. I see things most people only see on TV or in pictures. For example, I’ve seen two rainbows cross before at sea. Sometimes rainbows are so close when you are at sea that you can almost reach out and touch them. Every day at sea is a new adventure. Q: Where do you do most of your work? 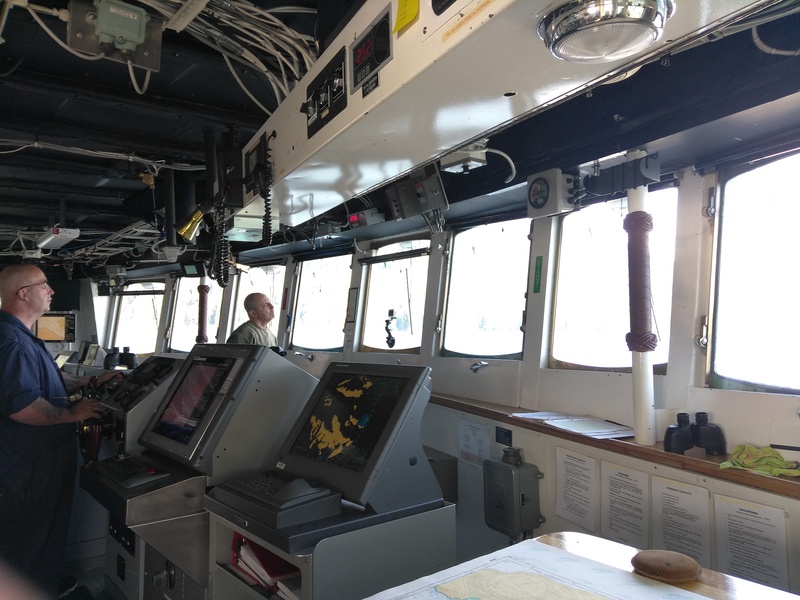 A: I mostly work as a helmsman (driver) up on the bridge (which is like the front seat of the car/ship). A helmsman is the person who drives the ship. 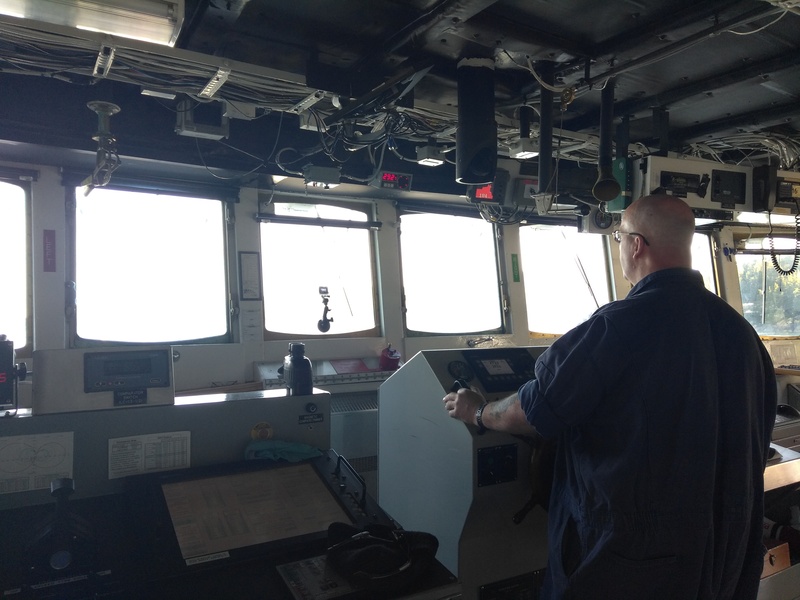 A helmsman keeps watch, looking for any potential dangers such as things floating in the water, other ships, and certain parts of land (such as sand bridges). 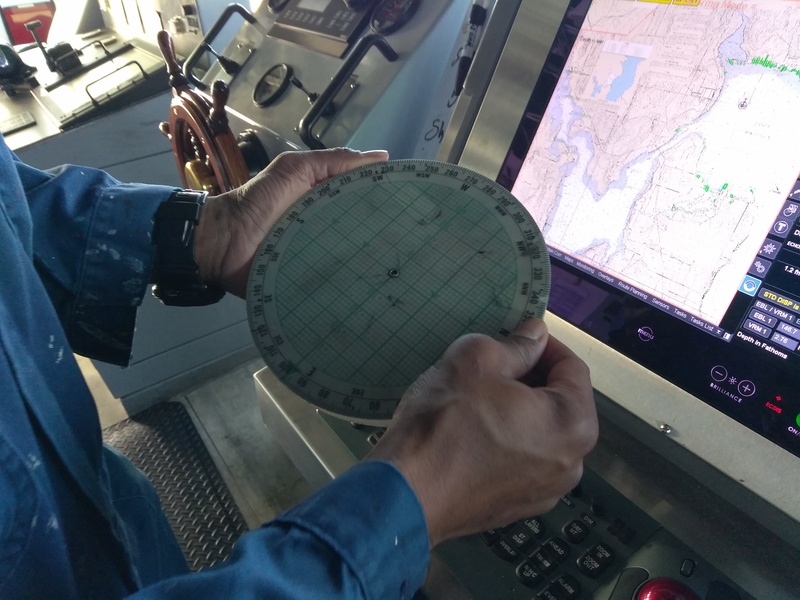 Another important part of my job is to understand how to read maps and use all of the radar and other navigational equipment up on the bridge. Q: What tool do you use in your work that you could not live without? Q: When did you know you wanted to pursue an ocean career? A: I always wanted to come to sea because my father was a sailor. I took a different route for a long time, but about 15 years ago I started my ocean career. I guess it was in my blood. It was hard to get started because I knew nothing about ships and what was required in the beginning. I went online and researched shipping companies and sent my resume out to a few hundred companies. I received a call from NOAA and began my sea career in Woods Hole, Massachusetts on a fishing vessel, NOAA Ship Albatross. By the way, Albatross is actually where the NOAA Teachers at Sea Program started. Q: What part of your job with NOAA did you least expect to be doing? A: I didn’t expect to be around the same people 24/7. You are always with the people with whom you work and your boss. Eventually, though, it becomes like a family. Q: How do you help wider audiences to understand and appreciate NOAA science? A: I would tell other people that NOAA is a wonderful job for people interested in going to sea. When you start off, you can go out to sea for a few weeks at a time. With NOAA, you have a chance to see and do things that you don’t get to do on commercial boats. You also are able to see new parts of the country. I’ve seen the east and west cost. The benefits are outstanding. Aside from traveling, I also have three months of vacation each year, something I would probably not have with a desk job, even after many years. Q: How did you become interested in communicating about science? A: When I was on the east coast, I was on NOAA Ship Henry Bigelow out of Newport, Rhode Island. 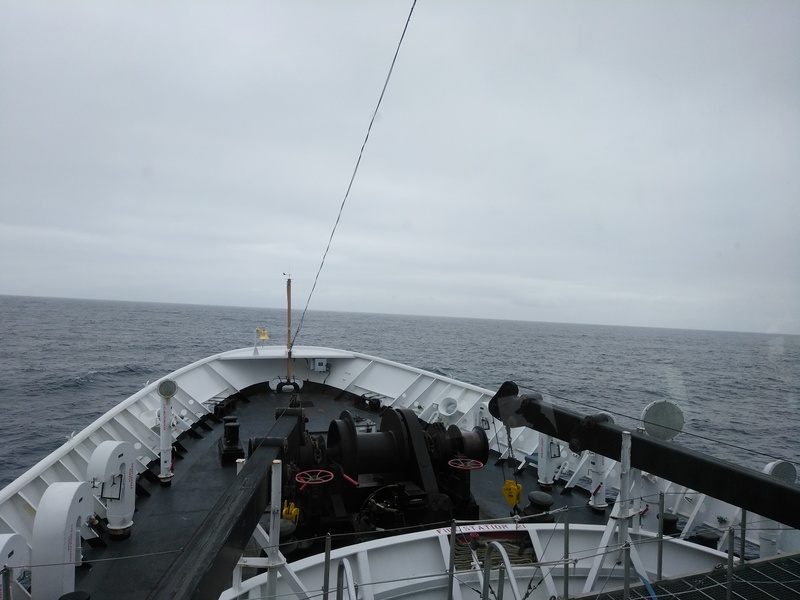 A group of scientists came onboard, and we sailed up by Newfoundland. We sent a special net nearly three miles down into the ocean. The most memorable thing was catching a fish that was about 2.5 feet long, incredibly white, paper thin, and had bright red fins. The scientists told me that this fish only lives two miles down. Experiences like this are once in a lifetime. That was one of the most exciting and memorable trips I’ve had with NOAA. Q: What advice would you give a young person exploring ocean or science career options? A: Don’t take the sea for granted. There is a mystery for the sea. We know more about the moon than we do about the oceans. There is so much to learn at sea. Even after fifteen years at sea, there is so much more to learn about the ocean. It is never the same. There is always something new to see. I’m still amazed by some of the things I’ve seen at sea, even if I’ve seen them over and over again. For example, hearing the sound of the glaciers hitting the water is unforgettable. Seeing the different colors of the ocean, you realize there is so much more than green and blue. Once you think you’ve learned it all, the ocean changes again on you. Q: What do you think you would be doing if you were not working for NOAA? A: I’d probably be back in Boston working as a chef. I went to school for culinary arts, but I think I’d be miserable if I wasn’t at sea. Q: Do you have an outside hobby? A: When I’m home, I like to work in my backyard. I like to work on my garden. I also like to work out. Q: What is your favorite memory as a student at the Edward Devotion School? A: I loved growing up in Brookline. It was a wonderful town to grow up in. I really feel now that being a kid at Devotion School was one of the happiest parts of my life. There is so much history at the Devotion School. Even after having traveled all around the country with NOAA, I love going back home to Boston and Brookline. Boston and Brookline are my favorite places. I still keep in touch with five of my friends from school in Brookline. We’ve been hanging out together for over thirty years. My friendships from grade school and later at Brookline High are still tremendously important to me today. 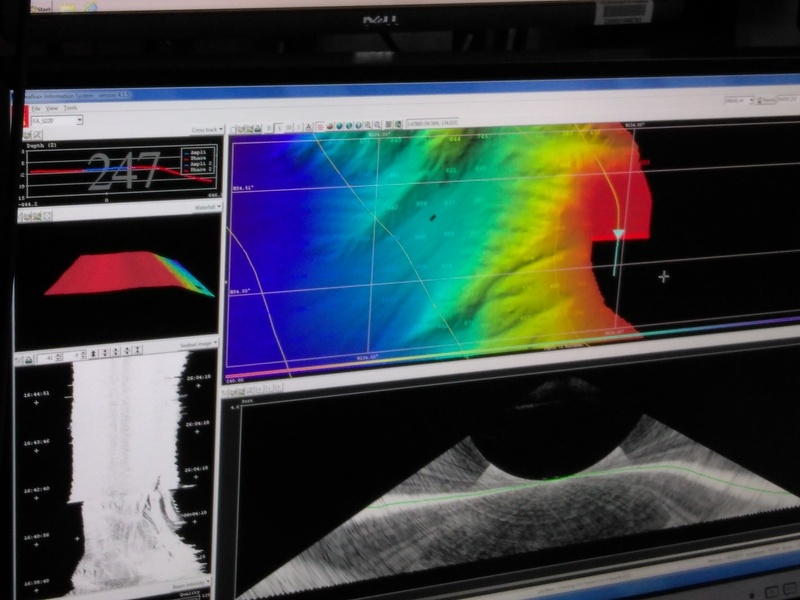 A: My role on the ship is to acquire and process data that gives us information about the depth of the seafloor. Q: Why is your work (or research) important? 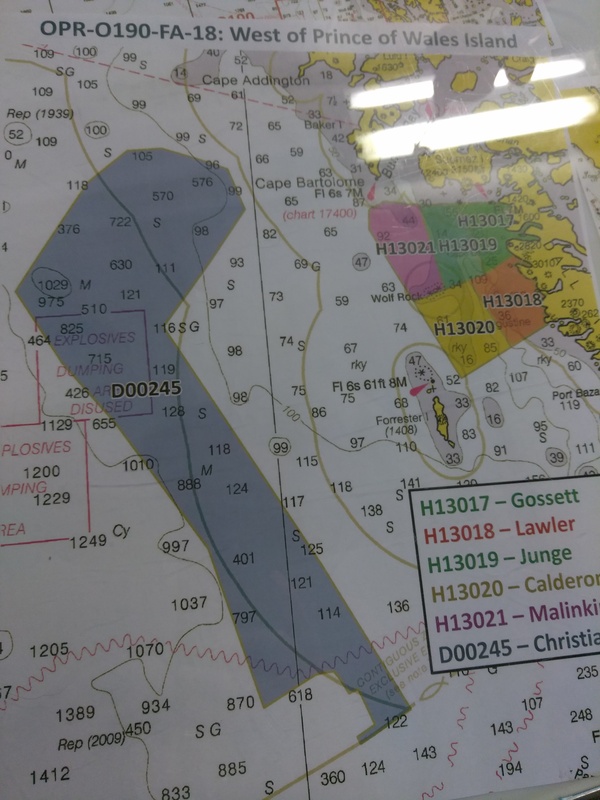 A: This work is important because it contributes to updating and creating charts (maps) that are navigationally significant for US mariners to keep them safe and to support them economically. And, it’s cool! A: I really like working on the small boats (the launches) and working in Alaskan waters is great. It is a really open and good learning environment for this field of work. I have learned a whole lot in just a year and a half. This goes beyond hydrography. I’ve learned a lot about others and myself and about working with people. A: I do most of my work in the plot room and on the launches. During the field season, we’re on the launches almost every day. The plot room is the data processing room where there are lots of computers. It is adjacent to the bridge, the central and most important location on the ship. Q: If you could invent any tool to make your work more efficient and cost were no object, what would it be and why? A: I would create something with lidar (lasers) or a super sonar. Lidar is used on planes or drones to scan and provide data back. Lidar on launches would help us get data quicker. A: I studied art in school, but then I switched to science. I’ve always liked ocean sciences. I decided to pursue an ocean career when I was 19. A: I run the ship store, which is never something I expected to be doing. 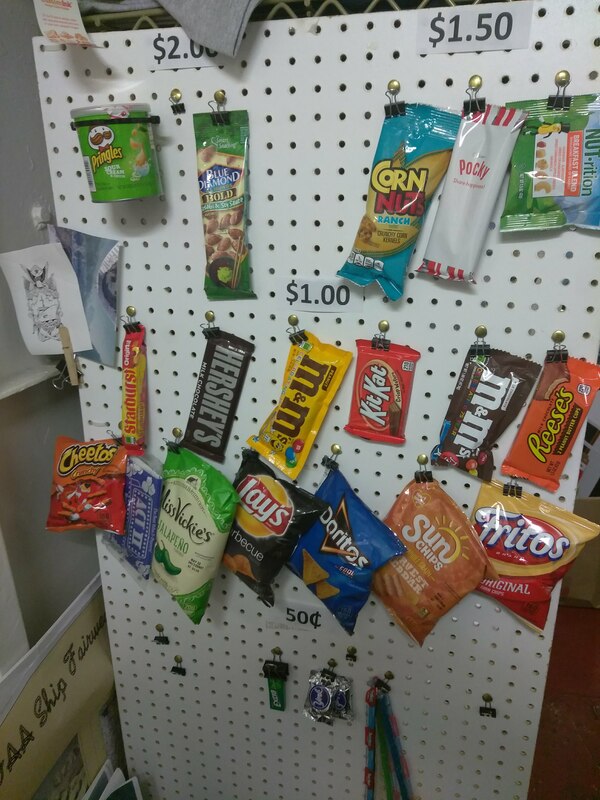 The ship stores sells snacks, candy, soda, and ship swag for the crew to keep morale high. 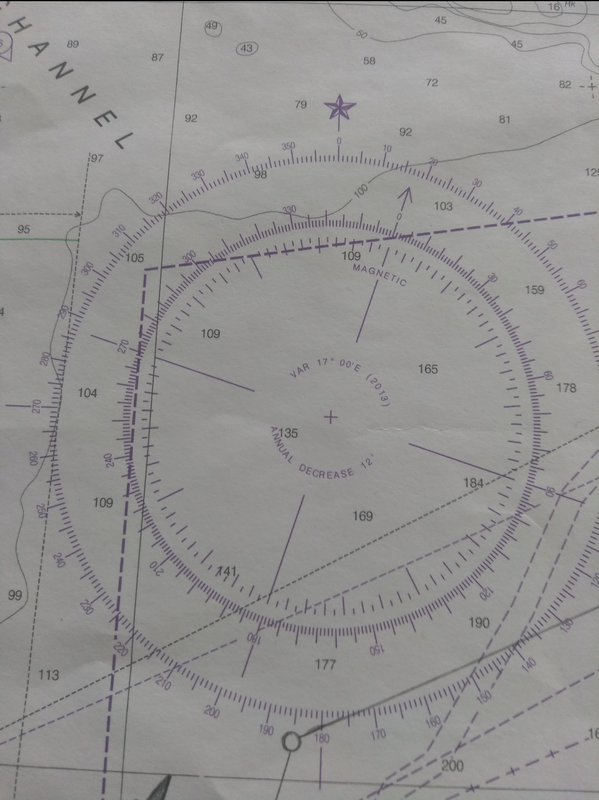 A: I usually explain the ship’s mission as updating and correcting nautical charts. Sometimes we have different projects. Last year, for example, we were searching for a ship that sunk in Alaska in February 2017. We found it! A: When I was in college studying geology, I realized exactly how important it is to communicate science, because there is a lot of knowledge there that we can all learn from and use. A: There are a lot of different things one can do. There are many different degrees from engineering, to environmental science, to biology. You can study ocean science, but you don’t have to. Any science can be applied in the ocean. It is not just science. You can learn about many different careers in oceans. Engineers and deck crew are great fields to pursue. You could also be a steward and travel a lot. A: I would probably be working for an environmental agency, but I would probably not be very happy. I might be at home with my dog. A: I like to paint. I also have a ukulele. I also love to read. A: I’m a utility engineer. I stand watch on the main engines and check all of the propulsion equipment. I do maintenance on the small boats. I work on air conditioning, refrigeration, heating, etc. I am jack-of-all-trades. A: There is always something too hot or too cold, something leaking or blocked. There is always too much of something or not enough of something else. That is really the challenge of the job. A: The travel aspect is the best thing about my job. I can go anywhere in the world I want to go, whenever I want to go. The oil field in Mexico is opening back up, and so now there is lots of work available. From a work aspect, it is challenging to understand why a piece of equipment isn’t working. Fixing the engines. . .or anything really. . . is all about following a process, working methodically. It feels good to be able to fix the boat and keep it in the water. A: I do most of my work in the boat shop on the small boats on E-Deck. That’s where all the maintenance is performed while the launches are in the davits (the machines that put the boats in the water). 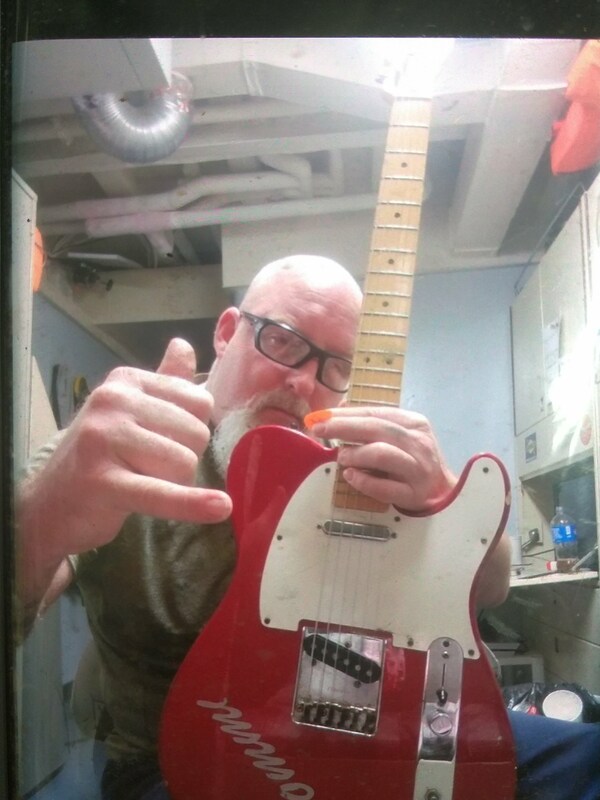 When underway, I spend eight hours a day in the machine room, but when in port I work mostly in the boat shop. Eight hours a day, four hours a watch. In addition to the two watches, I usually do at least two hours of overtime a day. During a watch, I walk around, checking all the machines, pumps, generators, boilers, air conditioners, fridge, freezer, etc. A: The first thing I always grab is a pipe wrench. It is always good to have one nearby. A pipe wrench is a tool that we use to take apart plumbing and to loosen and tighten any connections. I am pretty well known on this boat for unclogging restrooms and showers. A: I would want a third hand! There is always a time when you need another person. It would be helpful to have one more hand to do work more efficiently. There are lots of times when I can’t reach or need that extra hand. A: I’ve been sailing since 1990. 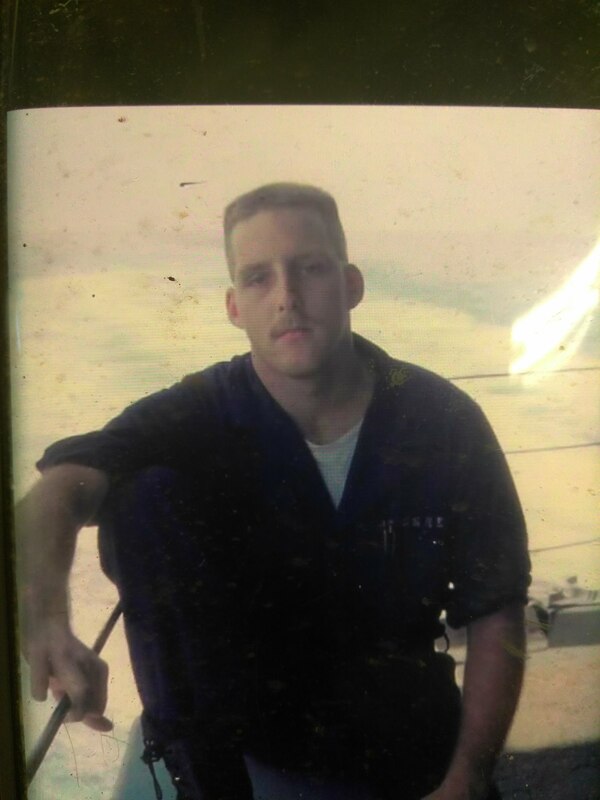 I joined the Navy in 1989. All my life I’ve liked being around boats and on the water. 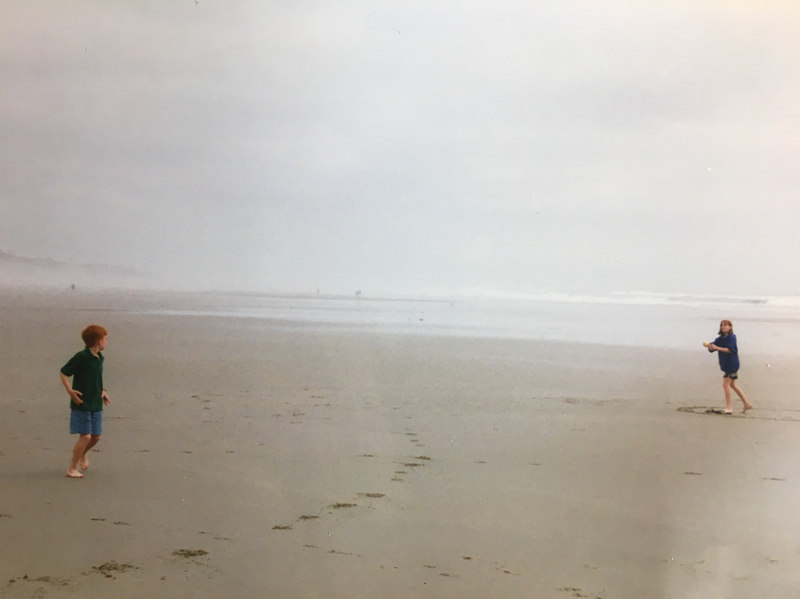 Even though I lived around the water when I was little, I never had the opportunity to go to sea, so it was something I dreamed about for when I was older. Living in Fort Lauderdale, I saw the Navy come through and watched all the ships. I thought it would be cool. 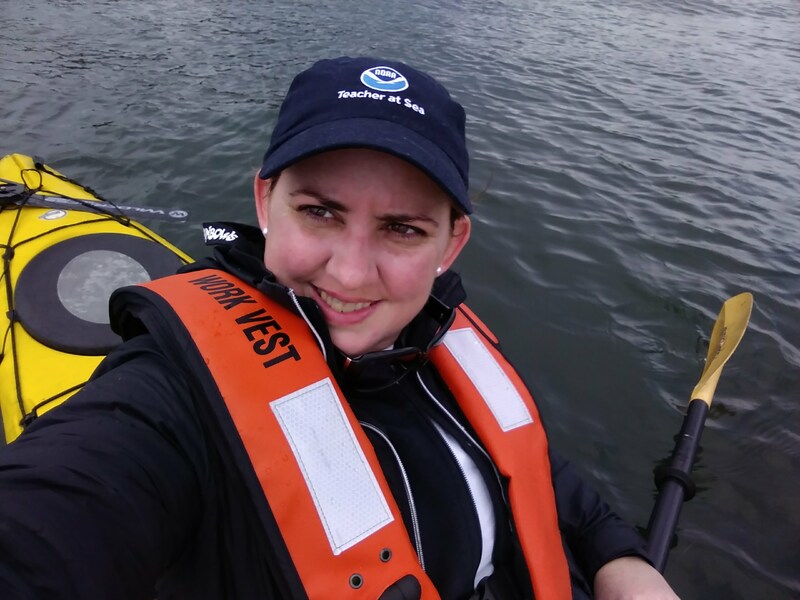 A: I had no idea where I would be going when I joined NOAA. Before I said yes to the job, they gave me the choice to go on the Fairweather or the Rainier. Initially, I wondered about Alaska. Nome, Alaska is as far away from home for me as Dubai. I had never been so far west. Alaska has been great, though. A: Everyone I talk to doesn’t seem to know what NOAA is. NOAA has various missions, mapping the bottom of the ocean, studying coral reefs, fish ecology (understanding how many tuna are in the middle of the Gulf of Mexico and what species of fish are on the reef off North Carolina). I don’t think people know enough about NOAA. Q: What recommendations do you have for a young person interested in pursuing an ocean career? A: I would study oceanography and math and science if you want to go to sea. Decide what type of career you would like; there are so many options at sea. A: If I wasn’t working for NOAA, I would go back to South Carolina and work in building or construction. I prefer NOAA! I play guitar and teach guitar. I was always a metal head. A: I work in the galley (kitchen), which is very, very busy. It is kind of like the heart of the ship. We work to feed everyone, make sure everything is kept clean, etc. There is a lot to do! We work twelve hours everyday. 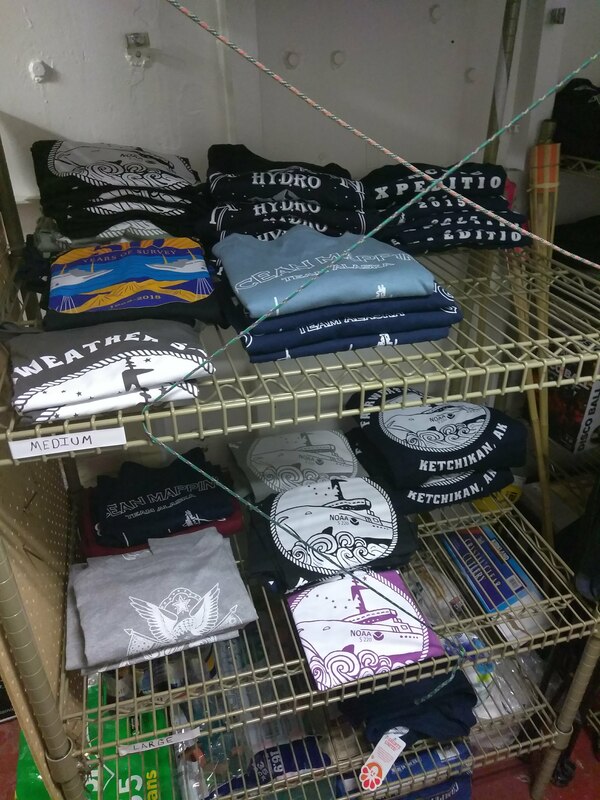 Many people think the galley is just cooking, but there is a lot more to the galley such as keeping track of massive amounts of stores (supplies), keeping everything fresh, and more. 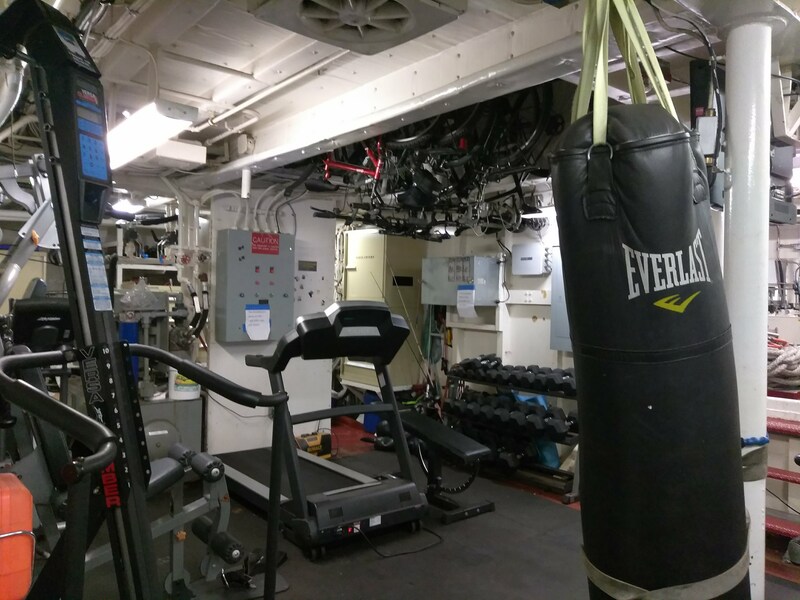 A: Keeping the mess deck (dining area) clean and keeping people happy and healthy with good meals is key. We boost morale. People look forward to sitting down and having a good meal at sea. We try to take peoples’ requests and keep the crew satisfied. A: I love being at sea. I love to cook. I like to see people happy and satisfied. I always try to keep upbeat. We all have to live together, so it is important to keep morale up. We’re like a big family at sea. A: I spend most of my day in the galley. All of the stewards cook. We rotate every week. One week, one cook is in the galley, and then we switch into the scullery (where dishes are cleaned). A: Another pair of arms to help cook. It is really, really busy in the galley! A: Well, I used to commercial fish. I have always loved being on the ocean. I grew up around fishing people. When I was little, I always wanted to live in a lighthouse. I also like being able to go to different places. It is exciting to always get to travel when at sea. I loved the French Polynesian Islands, where I traveled with NOAA. I worked out of Hawaii for about eight years, so I spent a lot of time sailing around the Pacific, visiting Guam, Sonoma, the Marshall Islands, and crossing the equator several times. On the East Coast, I enjoyed sailing Puerto Rico and the Caribbean. I also love Alaska, so sailing on Fairweather is great! Eventually, I want to move back to Alaska. A: I really love cooking, which is what I get to do everyday. I feel really passionate about my job. There isn’t anything I didn’t expect. You do have to really like what you do, though, at sea. A: All the ships do different missions. NOAA Ship Fairweather, for instance does mapping. Another NOAA ship I worked on put out buoys for tsunamis. NOAA helps keep oceans clean. NOAA also works with fisheries and brings many scientists out to sea to study the population of our oceans. NOAA even has gone on rescue missions for aircraft and other ships in distress. A: First, you should love the sea. It is hard sometimes if you have a family. Sometimes you miss out on important events, but if you pick a ship in the right area, you can see your family more often. Sometimes, NOAA isn’t what people expect. It is really hard work, but I love it. There are lots of different departments and jobs on the ship though, so it is possible to find something you love. A: I definitely would be working in culinary arts somewhere. A: I love to write, paint, draw, crochet, and read. I’ve always dreamed of writing children’s books. I used to tell my children stories, especially scary ones which they loved. A: I’m a junior officer (JO). Q: What’s the process for becoming a JO? A: The process to apply to become a JO is much like applying to graduate school. You write essays, get three to five letters of recommendation, fill out the application, and have an interview. You need a BS in a field relating to NOAA’s mission, which can be pretty much any math or science field (geology, physics, calculus, engineering, biology, environmental sciences, etc.). Then you attend BOTC (Basic Officer Training Class), which is held at the Coast Guard Academy along with their officer candidate school. Another way to become a JO is to transfer in if you were formerly enlisted. BOTC for JO’s lasts five months, and we have lots of navigation classes. A: NOAA Ships have three main categories: oceanography, hydrography, and fisheries. The major job of JO’s on ships is driving, we’re like bus drivers for science. When we are underway, 50% of my work is navigation, driving the ship, and deck stuff. 30% is collateral duties, extra administrative things to make the ship run such as thinking about environmental compliance and working as a medical officer. 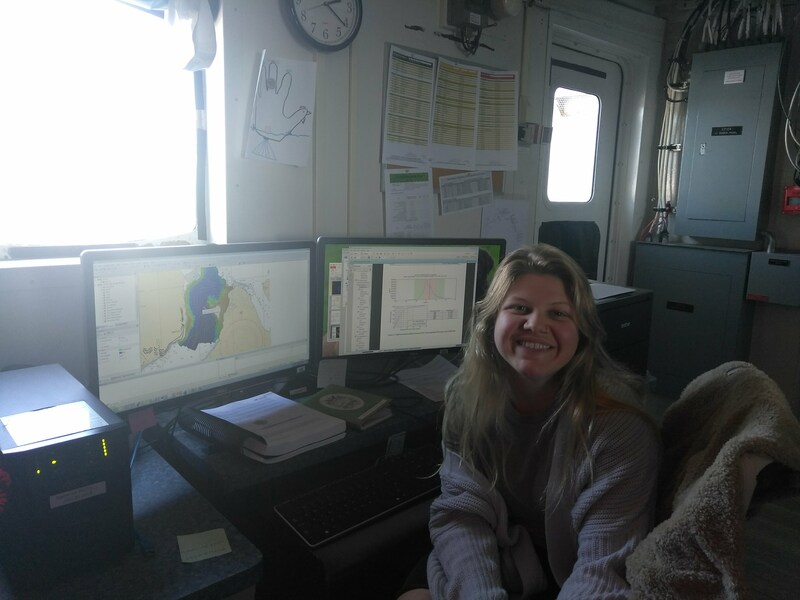 20% (which can fluctuate) is focused on hydrographic survey, driving small boats or helping with survey sheets, managing an area, collecting data, and being sure data is processed on time. A: I really enjoy knowing that I’m keeping people safe while they are sleeping. I really enjoy traveling. I really enjoy the sense of family that comes from living on a ship. A: All of the navigation is done from the bridge. The rest of the work is desk work. Any ship needs lots of administrative work to make it run. It’s like a space ship, a hotel, a restaurant, a family. To make all of those things run you need cooks, plumbers, etc., you need a lots of admin. It is like a government-run hotel. There is lots of compliance to think about. It’s a JO’s job to make sure everything is done correctly and all is well taken care of because it is paid for and continues to be paid for by tax payers. Everyone who serves aboard a ship has documented time of when you have been on the ship, sea-service letters. A commercial ship may have human resources (HR), and yeomen (arranges paperwork for travel, keep everything supplied and running, stocked, etc. ), pursers (who manage money and billable hours), but all of these tasks are done by JO’s on Fairweather. A: Red lights. At night, it is dark on the bridge. We can’t destroy our night-vision, so we use red lights, which are gentle on the eyes and don’t affect one’s night vision. 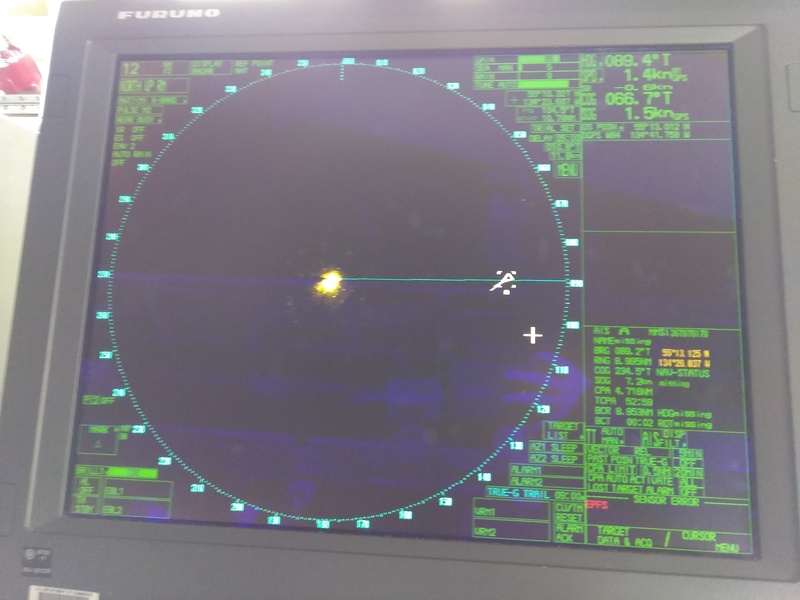 It’s important to be able to see the charts as well as to maintain night vision while keeping watch. A: I would hire someone to be the yeomen to make sure we never ran out of pens, always had travel vouchers, made sure copiers ran, and helped with all the other random jobs. A: Before I did this, I was a fisheries observer. I was a biologist who went out to sea. I always loved standing on the bridge and hearing the stories. I loved not commuting, not having to go to the office. I loved casting out to sea, working hard, and then, pulling in, tying up, and feeling a huge sigh of relief that the crew worked hard and arrived safely back in port. It stuck with me, I enjoyed that, and I decided to pursue a career with NOAA. A: All the administrative stuff! A: NOAA is everywhere, and sometimes people don’t appreciate that. NOAA produces weather reports and regulates fisheries in Alaska, where I’m from. NOAA could do a better job of advertising to the public its many pursuits. 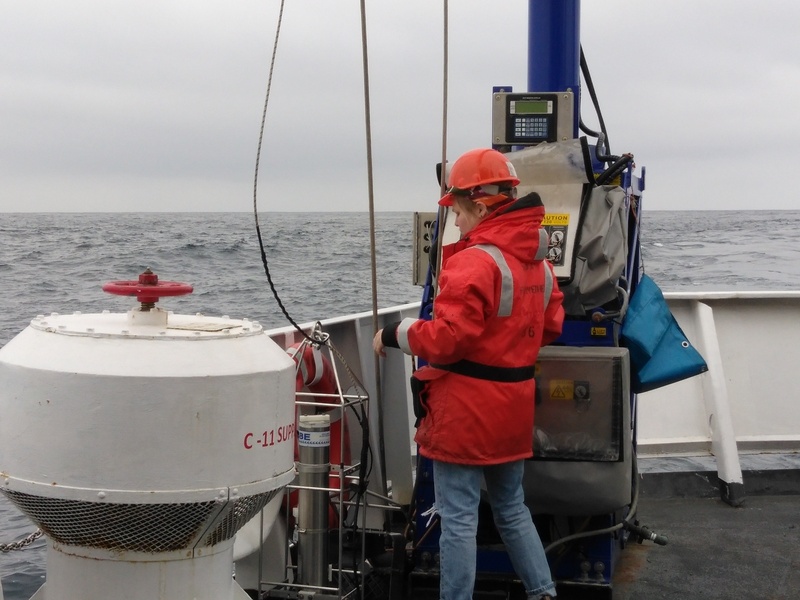 A: There are many cool internships on research vessels. The commercial sector will always take people looking for adventure. If you don’t make a career of it, that’s fine. At the worst, you learn something new about yourself while having a really cool experience. That is not such a bad thing. I highly recommend giving an ocean job a try. A: I would probably be in grad school. I would study city planning. A: I like walking. I like being in the woods. 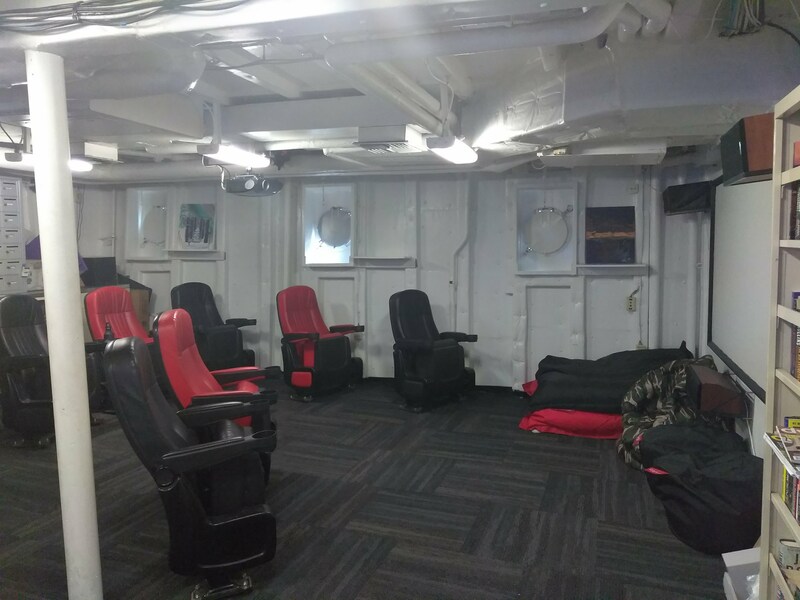 The Ship’s Movie Theater. Some Nights the Crew Gathers to Watch Films Together or Play Games. 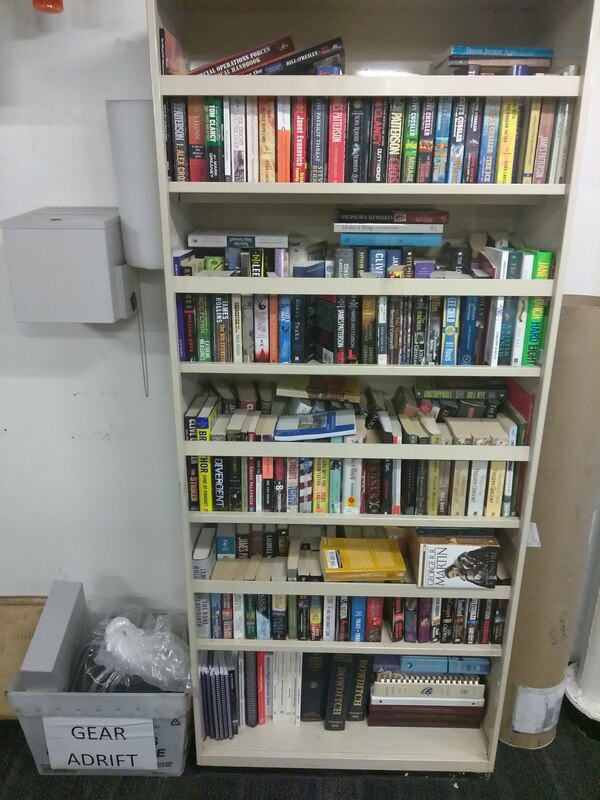 The Ship’s Library – Lots of Science Fiction and Suspense! 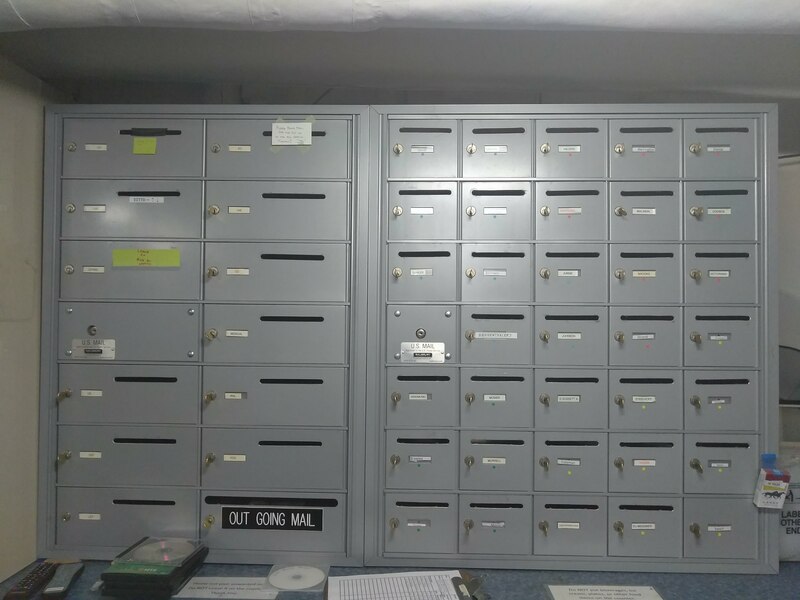 The Ship’s Mailroom – Mail is Sent to Each Port; One of the Many Things to Look Forward to in a New Destination. 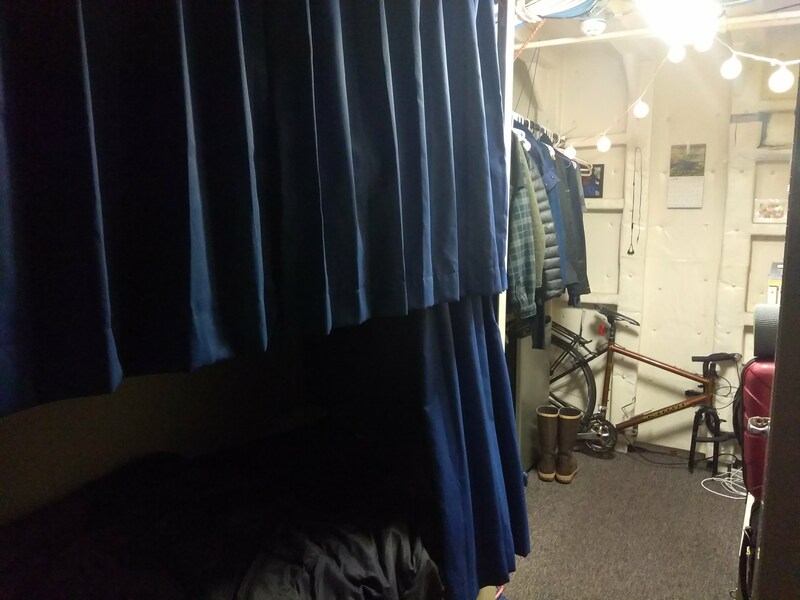 A Berth (or Living Space) on the Ship Shared by Two Members of the Crew. Note the Bunk Beds & Curtains. The Crew Works Various Shifts 24/7. Challenge Question #3: Devotion 7th Graders – Create a scale drawing of your ideal research or fishing vessel! Be sure to include key areas, such as those shown above. Remember that your crew will need space to eat, sleep, navigate, research, work, and relax. At a minimum, include the plan for at least one deck (or floor). Include your scale factor, show conversions and calculations, and label each area using some of the vocabulary included above. Needs some ideas? 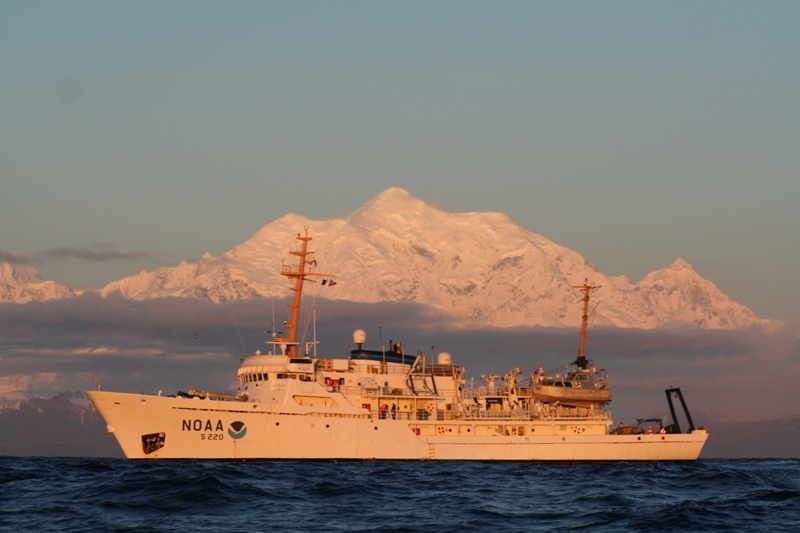 Check out this link to NOAA’s Marine Vessels for some inspiration. 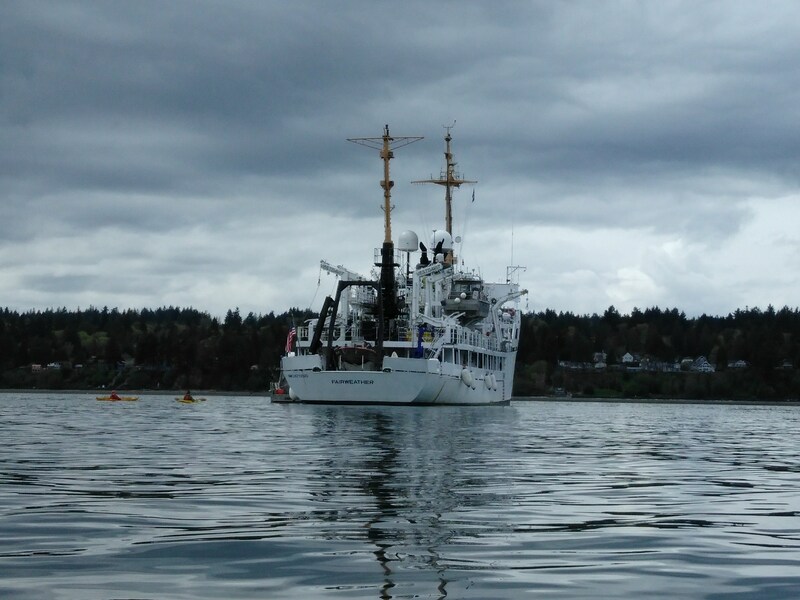 For the past two days, NOAA Ship Fairweather has been anchored in Port Madison, part of Puget Sound off the coast of Seattle, Washington. 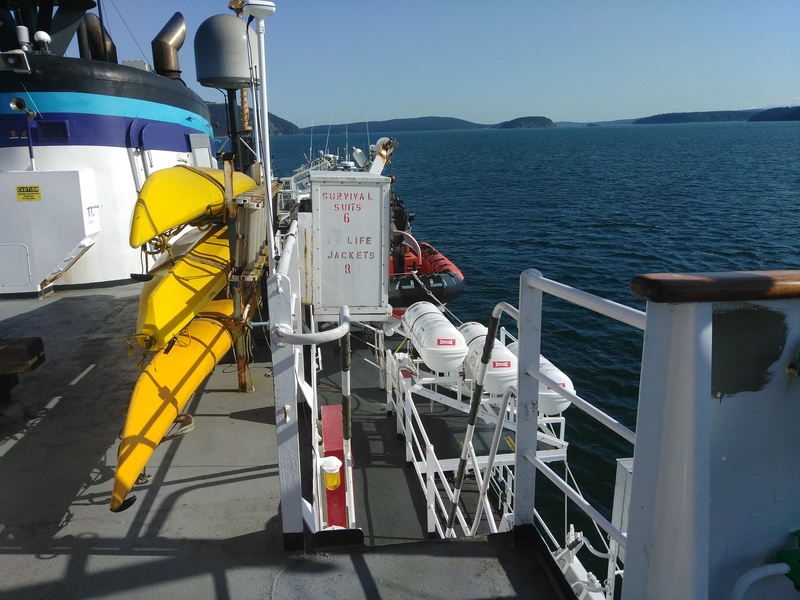 The crew is currently stopped for a few days in Puget Sound before heading north to Alaska in order to complete the yearly Hydrographic Systems Readiness Review (HSRR). During HSRR, the survey techs test all of the hydrographic survey equipment that will be used during the field season. It’s essential to test and calibrate the equipment at the start of the season in order to ensure the data accuracy for upcoming projects. The first part of HSRR began Thursday morning. Because NOAA Ship Fairweather spent winter at dock in Yaquina Bay, barnacles and algae were able to grow plentifully on the ship’s bottom, making it their home. The dive team deployed to check the Fairweather‘s hull and clean off the sonar transducers, removing any biofouling (sea life that had built up on the ship’s bottom) from the winter in port. On Thursday afternoon and Friday, the next phase of HSRR began. 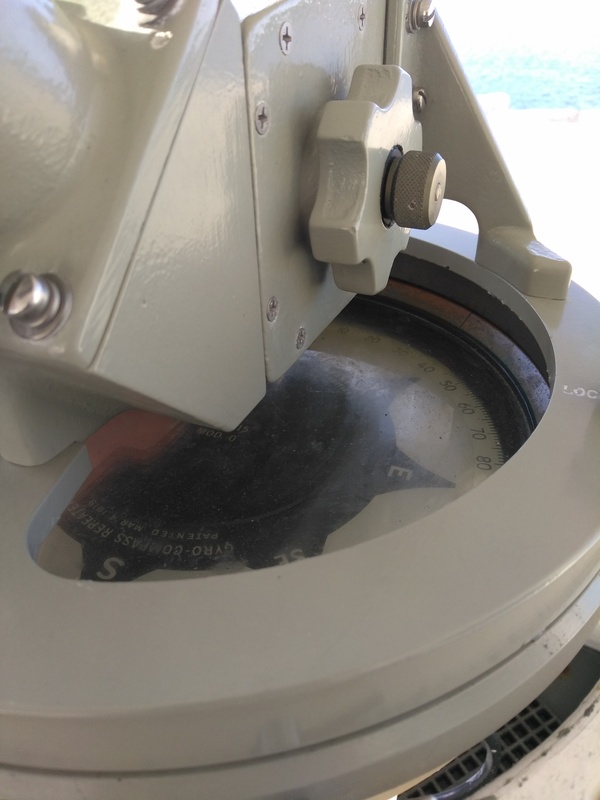 On Friday, I was able to spend most of the day on the survey launches as a few of the survey techs conducted patch testing (a process for precisely determining an orientation of the launch’s sonar). NOAA Ship Fairweather has four 28-foot launches, and I spent the morning on 2808, and then the afternoon on 2806. When working on projects in relatively shallow waters, the Fairweather deploys these launches to collect data more efficiently as four launches can work on a project simultaneously. 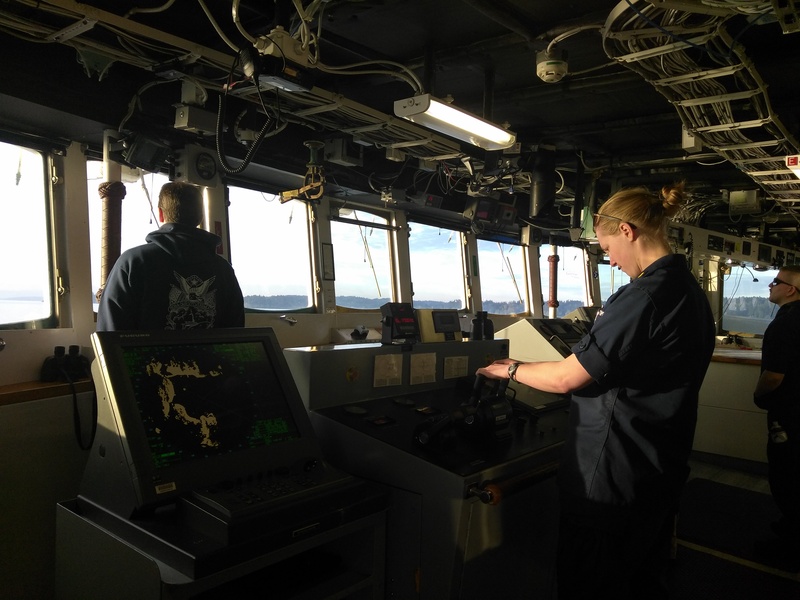 The launches are driven by a coxswain, often a NOAA officer or deck hand, while a Hydrographer-in-Charge (HIC) plans track lines for the vessel to run. Sometimes, a coxswain-in-training or HIC-in training will also join the launch. As part of HSRR, the HIC chose a few track lines for the launch to run, and the coxswain, drove the launch back and forth on the lines at various speeds. 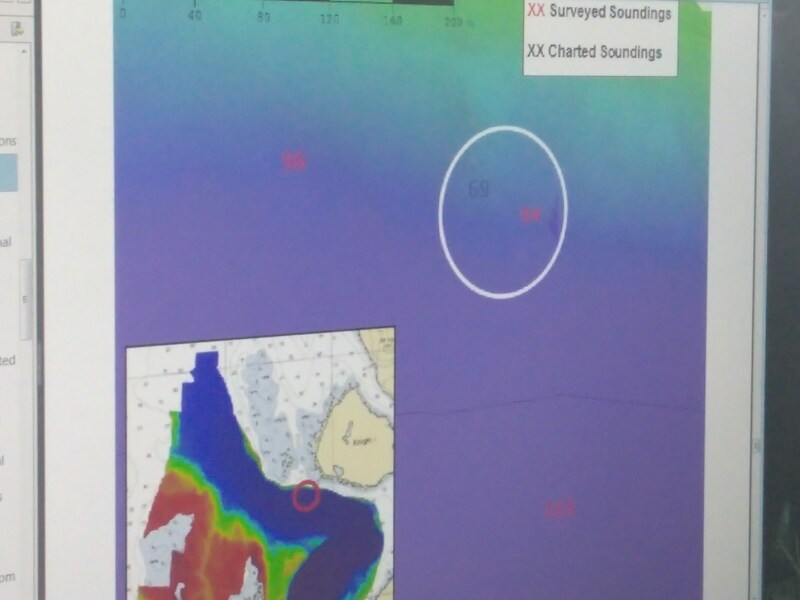 While we ran the track lines, the HIC was able to gather data by sending an acoustic ping from the sonar which reflects off the seafloor and is then recorded when it returns to the sonar. The two-way travel time of the pin is measured, which (when coupled with the speed of sound through the water) can be used to calculate the water depth. While in Port Madison, the crew will send all four of the Fairweather‘s launches out to run the same track lines and to ensure the data collected by each launch matches. At night, after the HIC’s have gathered data, the survey techs spend hours in the plot room, looking at the day’s data and checking for any discrepancies. The survey techs correct any errors in the data and the saved changes are sent back to each launch’s computing system. This is known as calibrating. By running patch tests and calibrating the launches to one another, survey techs are able to guarantee that data collected throughout the season is precise, no matter which launch is used for a given area. The CTD Up Close: The Powerful Little Machine that Measures the Speed of Sound! Conductivity refers to the ability of the given water sample to pass an electrical current. Survey techs are interested in the conductivity, because the conductivity is another way to gauge the salinity (or “saltiness” of the water). The more salt in a sample of ocean water, the greater the ocean water’s conductivity and the faster the sound waves travel. Next is temperature. 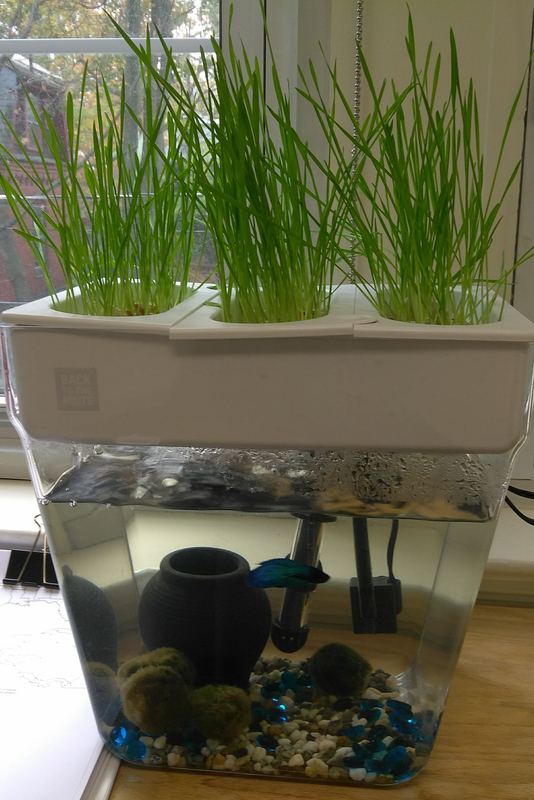 Water closer to the surface is warmer, and thus, sound will travel faster closer to the surface. Conversely, the cooler the temperature, the slower the sound waves travel. The final measurement is depth, or pressure. The deeper the water, the greater the pressure. Greater depths increase the speed of the sonar waves. The average speed of sound in the water is 1,500 m/s. By comparison, the average speed of sound in air is about 340m/s. After dinner, survey techs are assigned to night data processing. I joined one of the survey techs, Ali, who was kind enough to explain how the launch data is analyzed. One interesting note is the red light in the plot room. 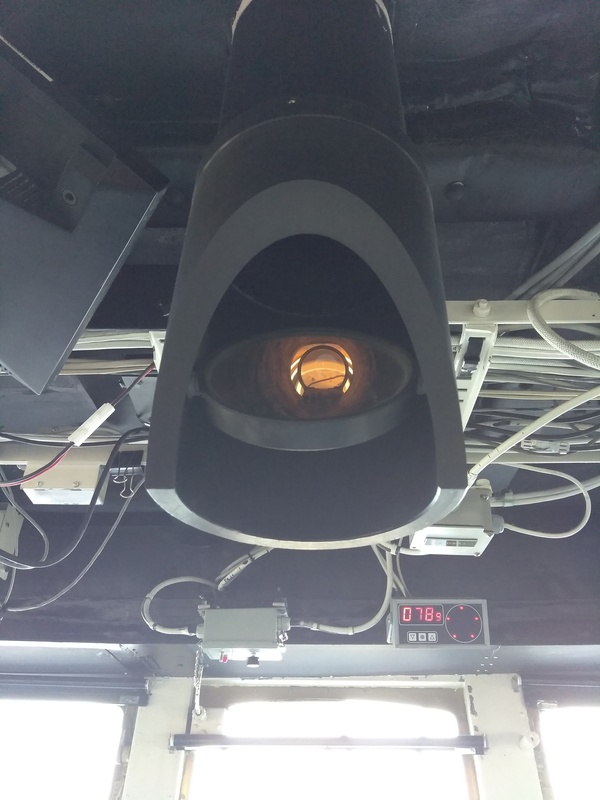 The red light is used because the plot room is next to the bridge, where the officers and deck crew keep watch. 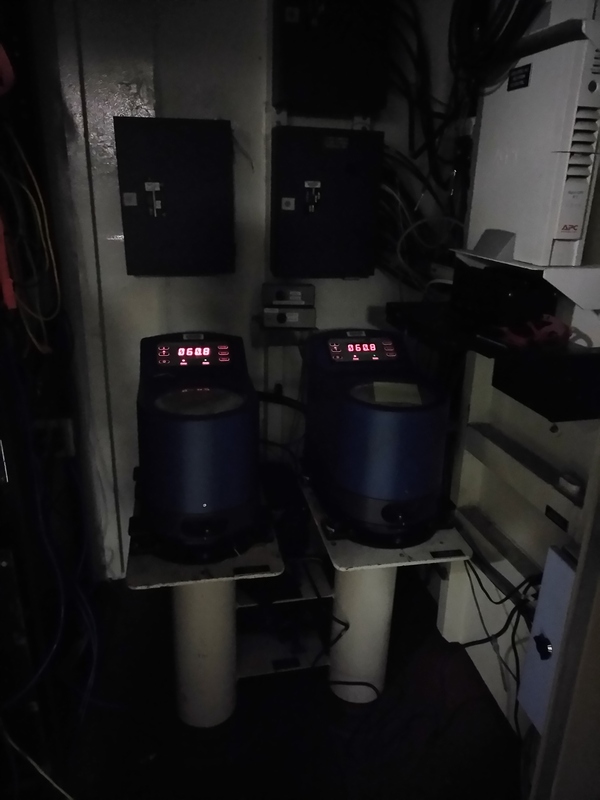 The red lights help the crew keep their eyes ready for night watch, so those processing data also work under red lights. In the above photograph, notice the various colors representing the differing ocean depths. In this case, red is shallower and purple is deeper. Notice that as the survey tech, hovers over a datapoint with her mouse, the data collected by Fairweather launch 2807 is shown as a coordinate with a depth of 168.3 meters. Creating a color “painting” of the data points is helpful because the changing colors help the survey techs understand the slope of the ocean floor; closer together colors mean a steeper slope or a sharp increase in depth, whereas larger swatches of the same color mean a flatter seafloor. The green lines in the picture represent the “lines” that the launch ran, meaning the area where the coxswain drove back and forth in the boat at varying speeds. Notice that there are two lines as the launches always run two lines to ensure accuracy. As the launch is driven back and forth in the water, the transducers on the bottom of the launch emits multi-beam sonar, and sound waves ping off the ocean floor several times per second, sending sound waves back to the launch which are translated into millions of data points by the survey techs. The survey techs use various computer programs and imaging software to analyze the data. Above, the survey techs can look at a 3D cross-section of the data, which essentially looks like a virtual map of the sea floor. In the bottom right corner, the survey tech compares two lines for accuracy, one with data points colored red, the other green. When the lines line up exactly, precision is ensured. The survey techs analyze the data to make sure the rocking of the boat in any direction (front/back, side-to-side, etc.) won’t interfere with mapping accuracy later in the season. Finally, survey techs compare their work with each other to ensure precise calibration. One of my favorite things about being onboard NOAA Ship Fairweather are the tremendous views every time I look outside. Sunrises and sunsets are spectacular. We’ve had some really great weather over the last few days, and though it has been a bit chilly, the skies have been fairly clear. On nautical charts (or maps), units of measurement vary. Ocean depths can be marked in feet, meters, or fathoms. Fathoms, like knots, is another term steeped in nautical history. When sailors used to measure ocean depths by hanging rope over the side of a vessel, they would pull in the line, looping the rope from hand to hand. The distance of the rope from one outstretched hand to another (a sailor’s wingspan) became known as a fathom. Challenge #2 – Devotion 7th Graders: Measure your wingspan, the distance from one outstretched hand to another. Then measure four other friends, classmates, or family members’ wingspans. What is the median wingspan for you and your friends? What is the mean wingspan for you and your friends? What is the mean absolute deviation for your collective wingspans? One fathom is equal to 1.8288 meters or 6 feet. If one fathom is the average sailor’s wingspan, how do your wingspans compare? Present your findings on a 8.5x11inch paper as a mini-poster. Include illustrations and calculations. Sea Wave Height: SW 3 ft at 5 seconds. NW swell 9 feet at 10 seconds. Wind Speed: 11 to 14 kt. Gusts to 20kt. Sky: AM showers, scattered clouds in PM. Though we were originally set to sail on Monday afternoon, predicted 10-15 foot swells for Monday evening delayed our departure from Newport, Oregon until Tuesday afternoon. The extra time in Newport allowed me to spend some time in the Plotting Room aboard NOAA Ship Fairweather. 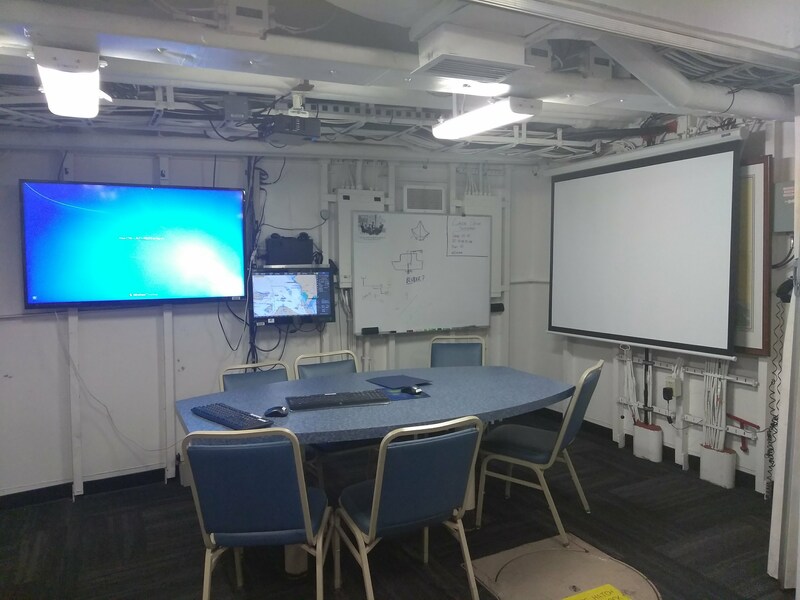 The Plotting Room is one of the main work areas for the hydrographers, the NOAA technicians who both plan the missions and then process data collected after each launch. The West of Prince of Wales Island Project. Notice how each “sheet” is assigned a color. One of the friendly surveyors, Bekah, gave me an overview of the upcoming project which will focus on the area west of Prince of Wales Island. 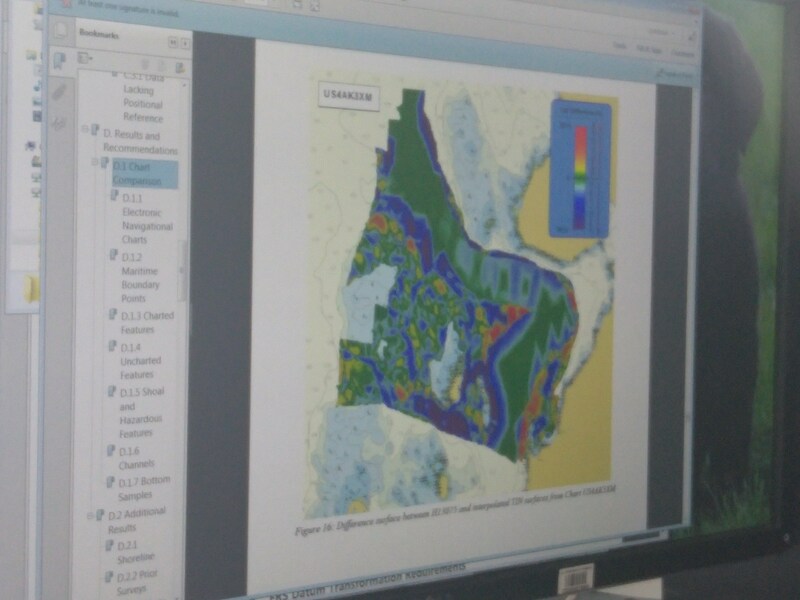 The hydrographic survey technicians first receive an assignment, known as a project, from NOAA. Next, technicians, break each project into “sheets,” or smaller sections, which are assigned to each technician or NOAA officer. 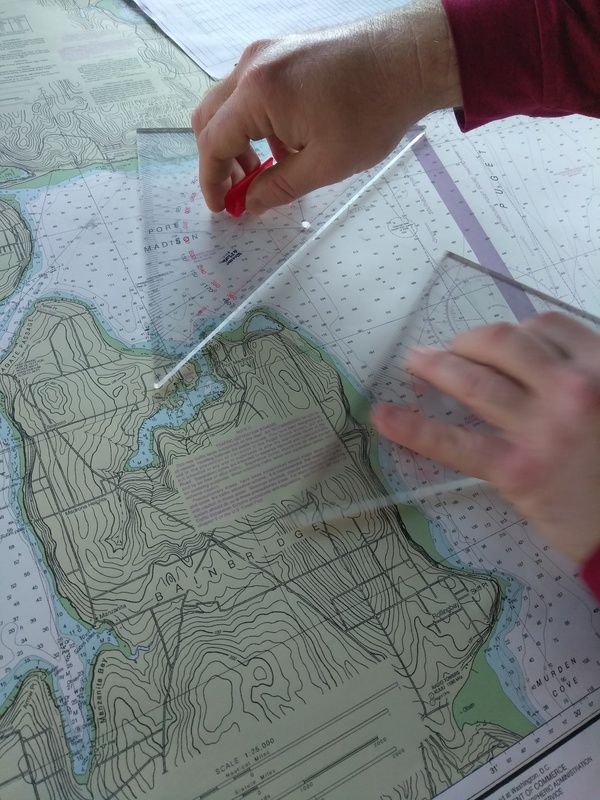 From there, the technicians further break down the sheets into “polygons.” The polygons are like mini-sections of a given area of the map, and are sized depending on a number of factors including the amount and distance from the shoreline as well as the depth. The polygons are assigned one-by-one to the survey launches to complete. A Sheet Sectioned into Polygons (in Blue). Notice the Topographical Markings on the Islands. 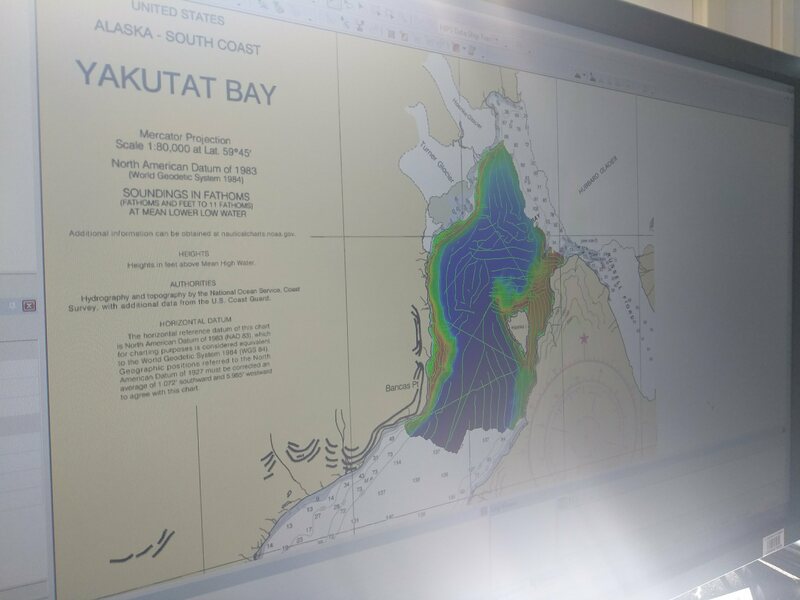 One of NOAA’s primary goals with hydrographic surveying and updating the charts is to obtain more accurate data on the Pacific seafloor and its features in order to promote safe marine navigation. 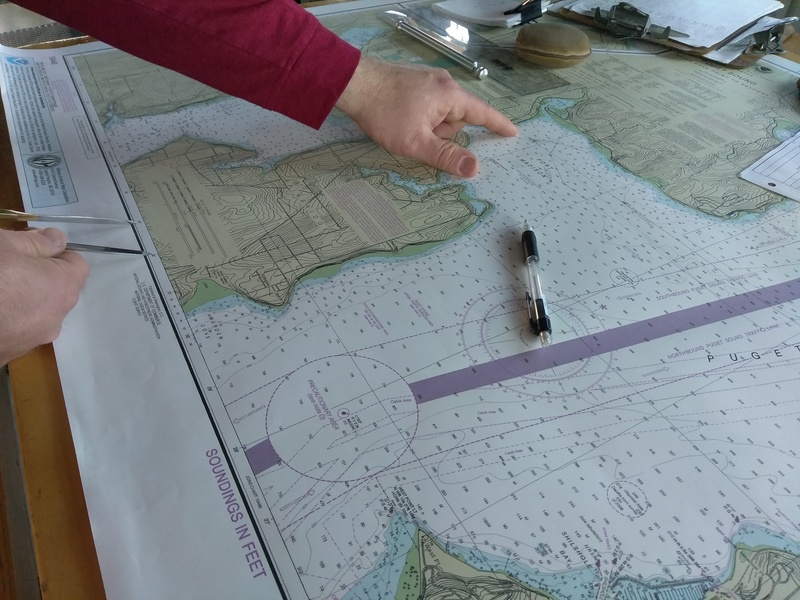 NOAA is part of the US Department of Commerce, and so updating navigational charts will help improve safe passage of all ships, especially commercial cargo ships. As commercial ships grow larger and heavier and global trade continues to increase, improved navigational charts allow for increased shipping drafts (how deep the vessel extends below the water, which is a function of how much cargo they can load), which in turn creates a positive economic impact for the national economy. 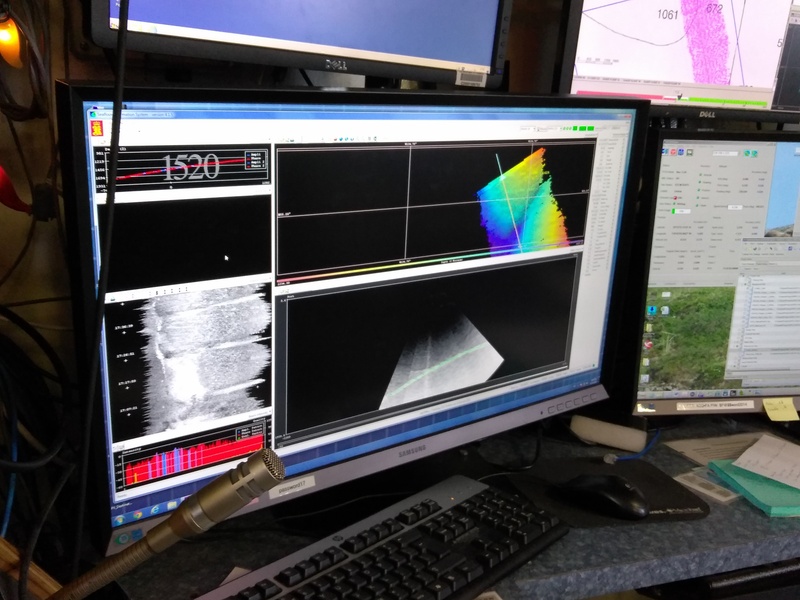 Today, NOAA Ship Fairweather uses sonar to measure seafloor depths. Previously, hydrographers used lead lines. Essentially, lead lines were dropped over the ship’s rail and lowered until they rested on the seafloor. While lead lines are occasionally still used today in very shallow areas close to shore, creating new seafloor maps with sonar allows for much greater precision, are much less labor intensive, and allow for continually measuring the depth. On Tuesday afternoon, at 14:00 (2pm), we set sail from Newport, Oregon and began making our way north to Port Madison, near Seattle Washington. After spending a few days at dock in Newport, I was eager to get underway, and the rest of the crew, many of whom had been in Newport for much of the winter, also seemed eager to begin the season. While the views leaving Oregon were spectacular, the wide open seas proved a bit of a challenge. I quickly learned that heading to the open deck on the back of the ship, the fantail, was an ideal place to catch some respite from feeling seasick. Later in the evening, the waves subsided a bit, and by morning the seas felt much calmer. Some Really High Waves Crashing on the Fantail! Most aboard NOAA Ship Fairweather work several four hour shifts or “watches” each day, and some may also work a few additional hours of overtime. Perhaps for this reason, meal times seem a bit early with breakfast at 7am and lunch at 11am. Dinner, when in port is at 4pm, and at sea, it’s at 5pm. 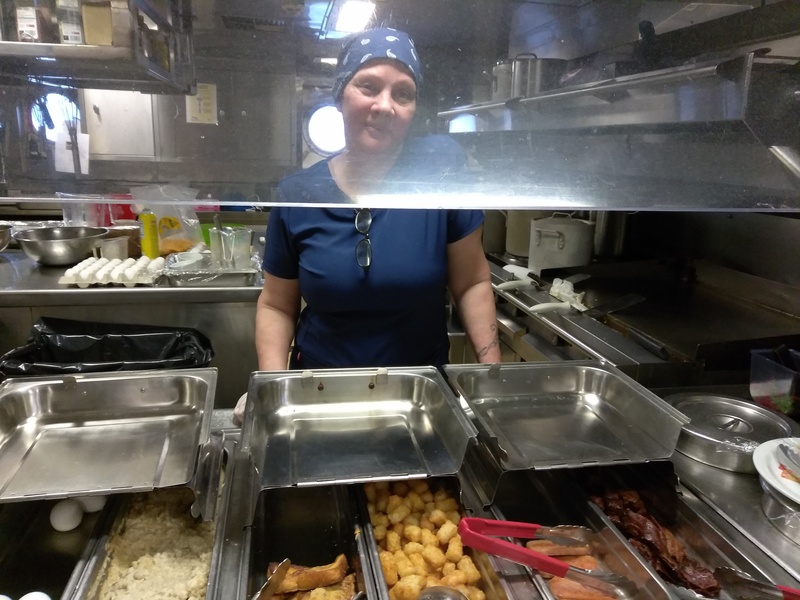 Meals are prepared in the ship’s galley (or kitchen), and served buffet style. The crew eats together in the mess (or main dining area). In addition to meals, snacks such as cereal, fruit, and icecream are available 24/7 and some additional options are available for those on night watches who may eat “night lunch.” Meals are a great time to meet the many aboard Fairweather and better understand how the different teams–the wardoom, the engineers, the survery technicians, the deck, the stewards, the ET, and the visiting scientists–all work together. NOAA Ship Fairweather is celebrating its 50th birthday this year! Fairweather was designed by the US Deparment of Commerce Maritime Administration and built in Jacksonville, Florida by Aerojet-General Shipyards. Fairweather was commissioned in October 1968 and is homeported in Ketchikan, Alaska. Fairweather’s sister ship is NOAA Ship Rainier which is also part of NOAA’s Pacific Fleet. NOAA Ship Fairweather has a field season of about 220 days per year. At 231 feet long, it can house roughly 57 crew and weighs 1591 tons! While cruising, Fairweather averages 13 knots, and while surveying, the ship travels 6 to 10 knots. By the way, you might be wondering what exactly is a knot. As the story goes, ancient mariners used to tell how fast their ship was moving by throwing a piece of wood tied to a rope overboard and measuring how much time it would take the wood to travel from the bow (front) to the stern (back) of the ship. According to historian Elizabeth Nix, by the 16th century, this method was updated to include knots tied at certain intervals in the rope that was thrown overboard. Sailors began to count the knots to determine a ship’s speed, and eventually a “knot” became a nautical mile per hour. Nautical miles, by the way, refer to the Earth’s circumference, and are different from “land miles” which reflect the distance it takes to walk 1,000 steps (according to the Romans) or 5,280 feet (according to Queen Elizabeth). Today, one nautical mile is understood as 1,852 meters or 1.1508 miles. Or, more practically, it is one minute of latitude (where 60 minutes of latitude = 1 degree). A knot, then, is a measure of speed used by ships and planes. A rate of one knot refers to covering a distance of one nautical mile in one hour. Challenge Question #1: Devotion 7th Graders — Can you convert the speed of your favorite land animal, your favorite sea animal, your favorite bird, your favorite car/plane/boat, and this year’s Boston Marathon winner (male or female) to knots? Show the work to justify your conversions and then create an illustration comparing your choices.